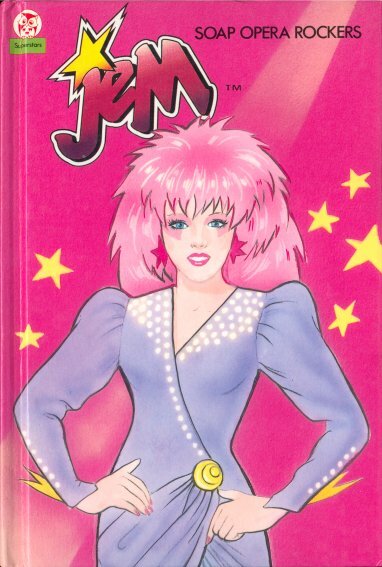 There were a bunch of Jem story books released, aswell as activity books, sticker albums, note books. Some of the US books were translated in French, while the UK created their own storybooks and coloring/activity books. 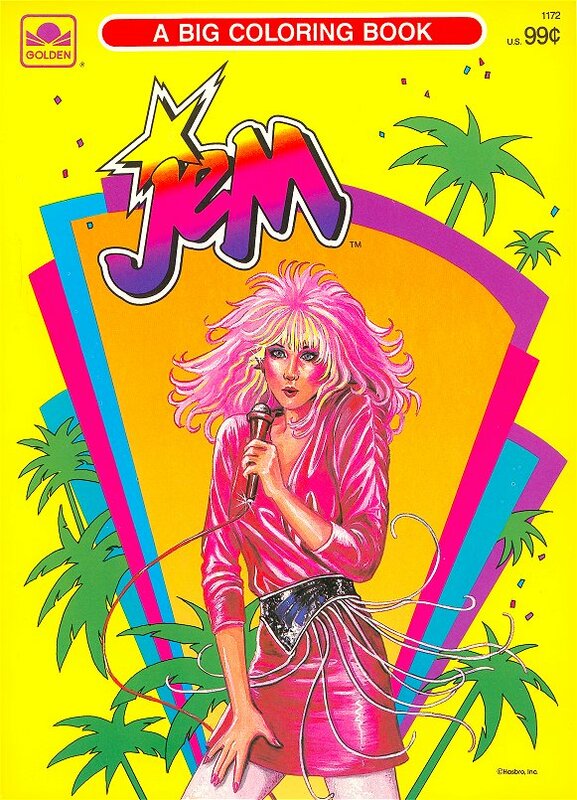 The books deserve their own piece of recognition as part of the Jem universe. 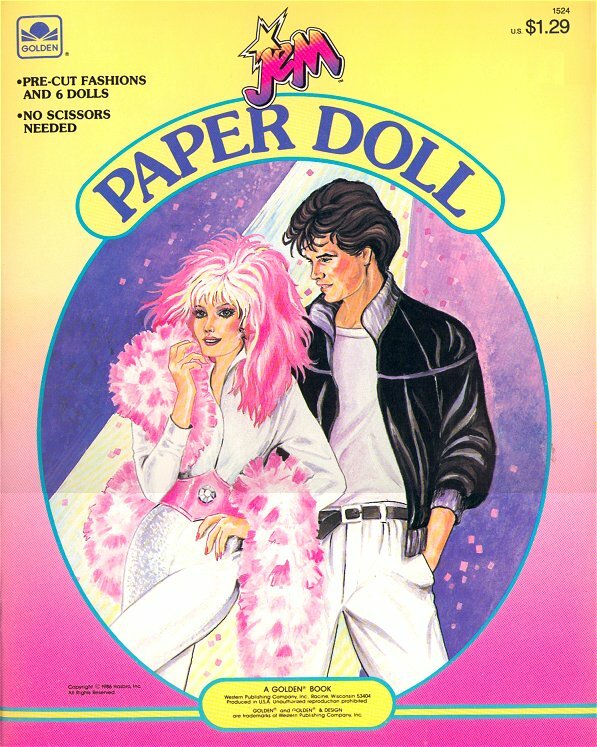 Or rather, their stories can almost be considered an alternate Jem universe, because although the books are mostly based on the stories from the cartoon and the drawings from the doll boxes, the characters act and look a little different. They create their own paralell style of Jem. And this even differs between the different books. 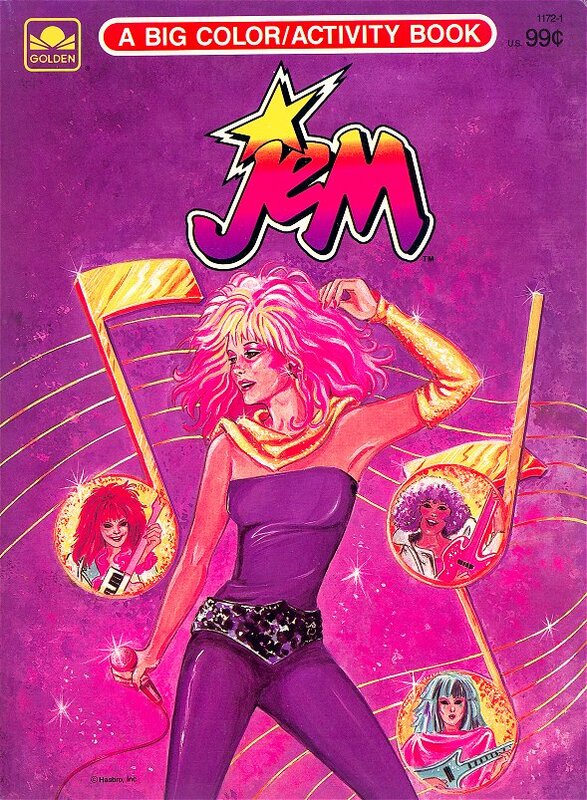 It's interesting to see all the different versions of Jem, different hairstyles, colors, personalities, fashions, by the different artists and writers (most of which we don't even know the names). Personally I think most of the books make the characters look a bit old fashioned. 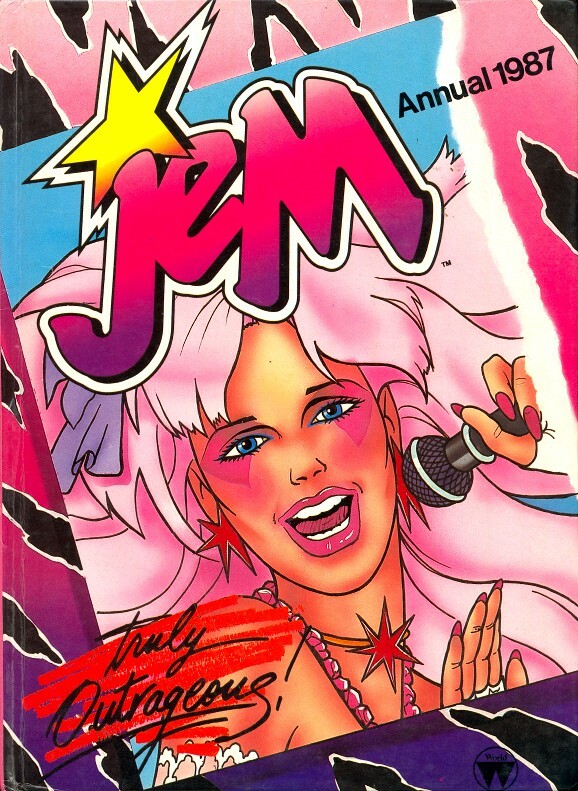 But after seeing all the Jem episodes so many times, it's entertaining to also read all these stories. 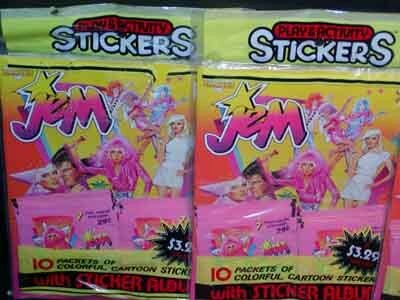 Just like with most Jem things, there are collectors of it. So how rare are the different kinds of books? As for the US books: storybooks, sticker albums, coloring books, there are no rarities at all, though some are slightly harder to find. Most of the UK books are very easy to find and cheap nowadays, with a big exception of the activity books. Some books from Italy and everything from Sweden is very rare. 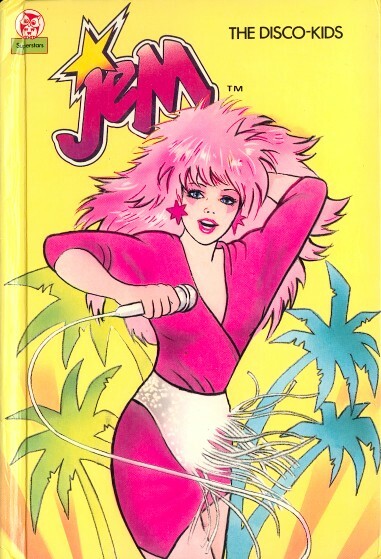 All the US Jem books that are illustrated, were illustrated by Tom Tierney, who also illustrated the books for Barbie and the Rockers. The back of the books advertises the other books in the series, and also the paperback titles. These stories were also released in France by Whitman, with French titles. Written by Deborah Kovacs. Illustrated by Tom Tierney. French title was "Le concours de rock". 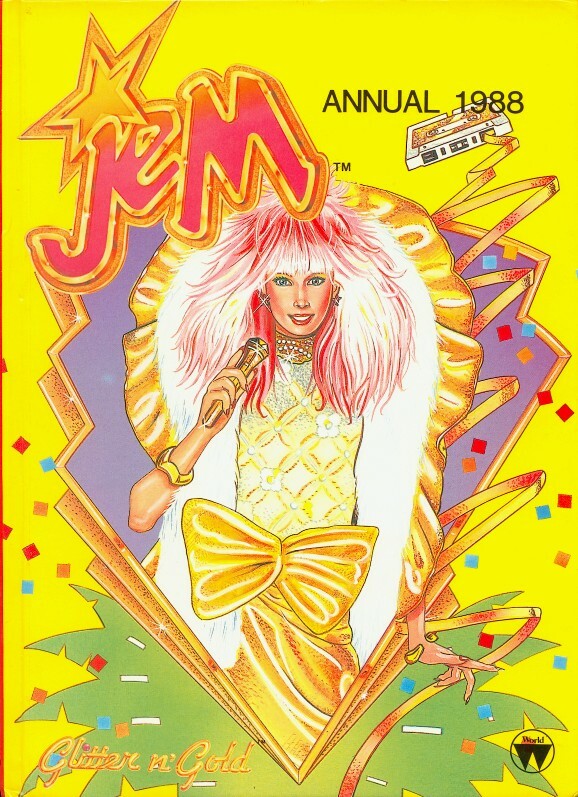 Story: The same as in the first five episodes of the Jem cartoon (or rather "The Beginning" and "The Battle Of The Bands"). 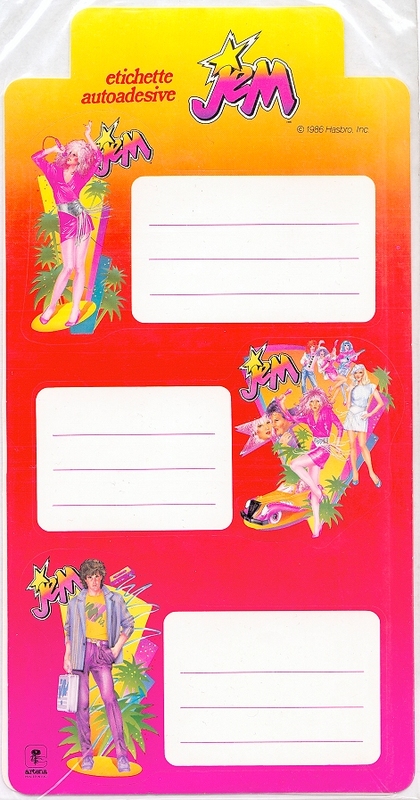 Characters: Jem/Jerrica, Kimber, Aja, Shana, Pizzazz, Roxy, Stormer, Rio, Eric, Synergy, the Starlight Girls, Howard, Zipper, and the Limp Lizards. 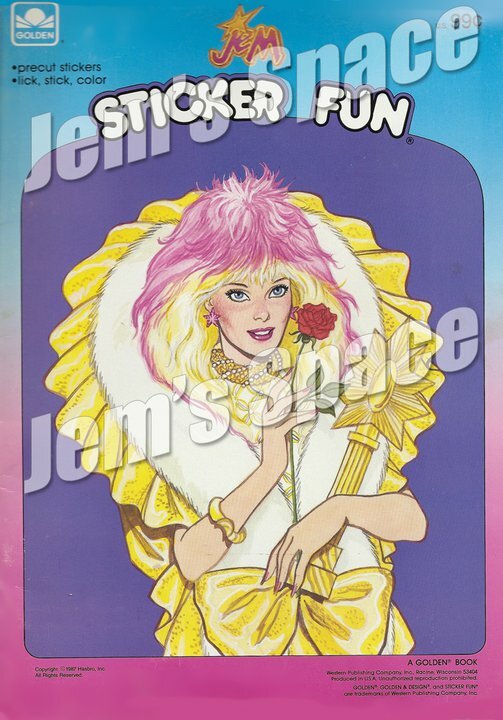 Although the story is the same as in the first five episodes of the Jem cartoon, there are several noticable differences. The Jemstar earrings are shaped as regular stars. 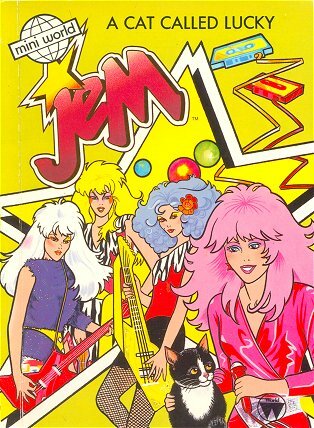 The hairstyles on Jem and the Holograms are different, especially Jem who has pink and blonde hair, and Shana who has a round afro. Synergy appears in the mirror in Jerrica's bedroom. Aja and Shana are called "Jerrica's roommates". 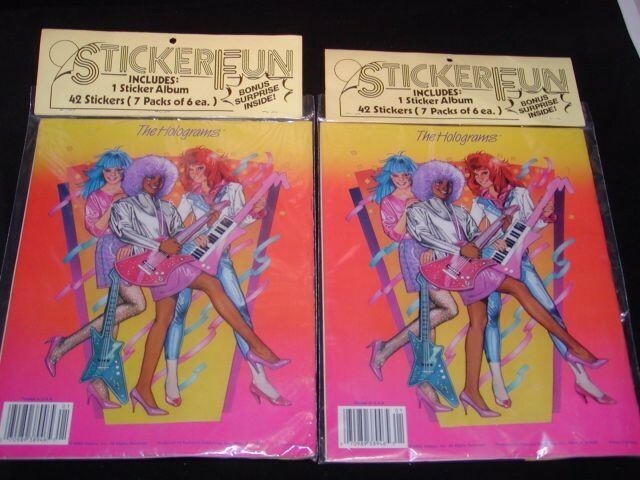 The Holograms and the Misfits' instruments are the doll versions. Kimber has the keytar the doll came with which was never seen in the cartoon, and she even has it before they find the instruments at the Starlight Drive-in, but Aja gets hers at the Drive-in. Kimber refers to Starlight Music as "half ours". Kimber calls Eric Raymond "dad's partner" while in the cartoon Emmett called him "assistant". The Misfits come driving into Eric's office, not on the guitar-shaped motorcycles, but on regular motorcycles. 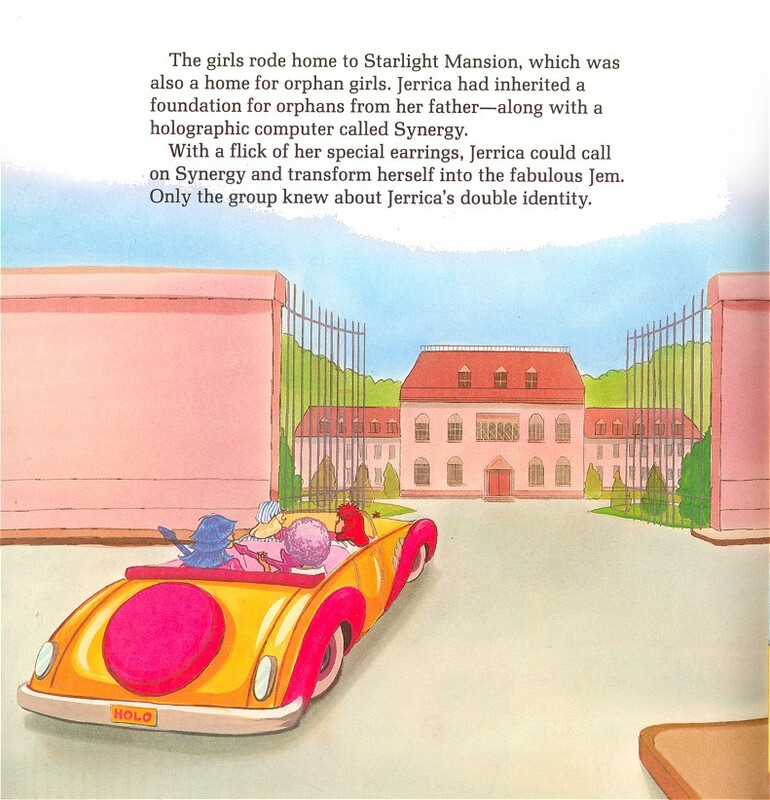 At the Starlight Drive-in, Synergy appears as a large face only, and nobody needs to walk through a wall, Synergy starts removing the holographic walls instead. Kimber says the line that was Jerrica's in the cartoon "Father made you?". 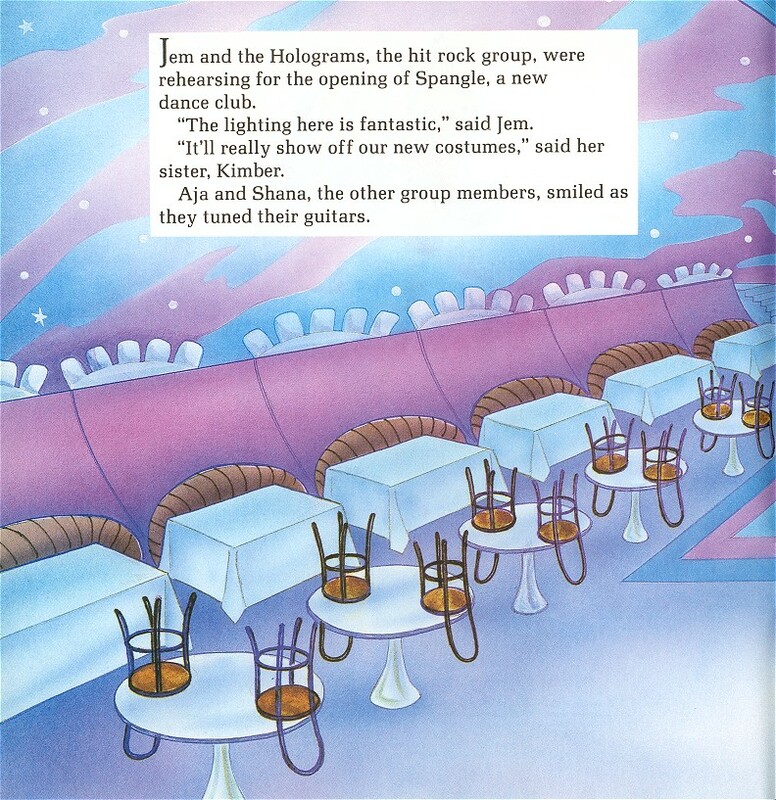 Jem comes up with everything about the band right at the Starlight Drive-in, she decides that Kimber will write the lyrics, Rio can be their manager but he must not know Jem is really Jerrica, and Jerrica herself will be the leader of the band which will be called "the Holograms". The Limp Lizards are actually dressed out as lizards. Instead of by accident, Zipper burns down Starlight House intentionally and smiles looking back at it. Some of the fashions have other designs, colors and patterns. Zipper has three friends that don't resemble the ones in the cartoon. 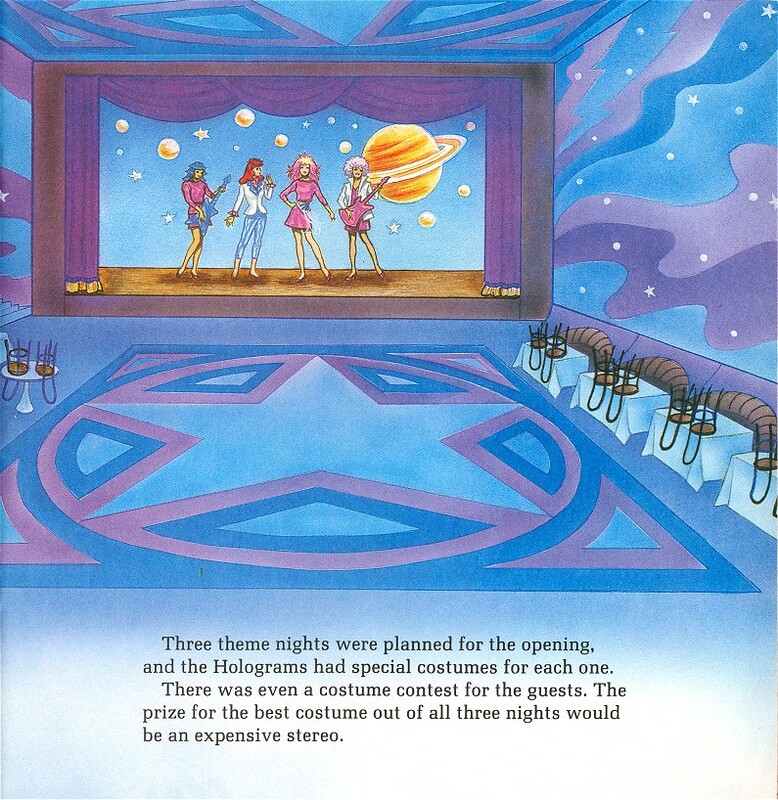 Instead of arriving themselves to the Starlight Drive-in before the contest, the Holograms are thrown into the back of a van and taken to a dark warehouse. Instead of Lions there is a tiger and then a train. 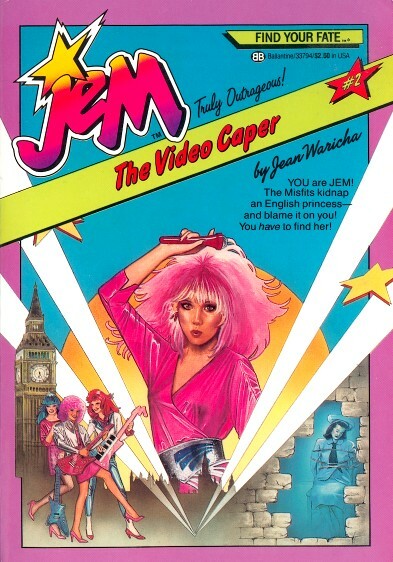 Instead of getting help by Rio and and the police, Jem and the Holograms escape themselves. Rio wears the outfit the doll wore, but has brown hair. Shana plays guitar instead of drums, like the doll. Written by Rusty Hallock. Illustrated by Tom Tierney. French title was "La nuit aux mille étoiles". Story: The Top Rock Music Awards is coming up, and the envious Misfits plan to get even on Jem and the Holograms when they accept their award. 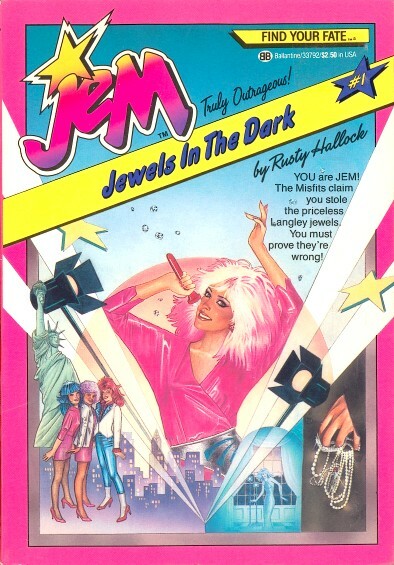 When Jem takes off her earrings for the hairstylist, the Misfits take their chance to steal them and throw them out to a crowd of fans, all wearing copies of Jem's earrings. Characters: Jem/Jerrica, Kimber, Aja, Shana, Pizzazz, Roxy, Stormer, Synergy, Rio, Donovan, Katie MacDonald, and David Michael Springer. 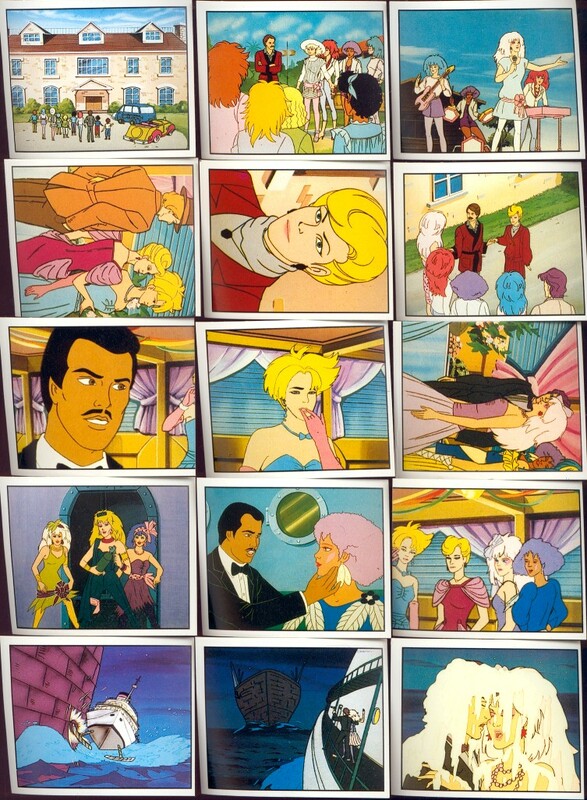 The story is a bit similar to the cartoon episode "Adventure In China", with the hunt for the Jem star earrings. Jerrica is rehearsing with the Holograms by using a conductor stick. 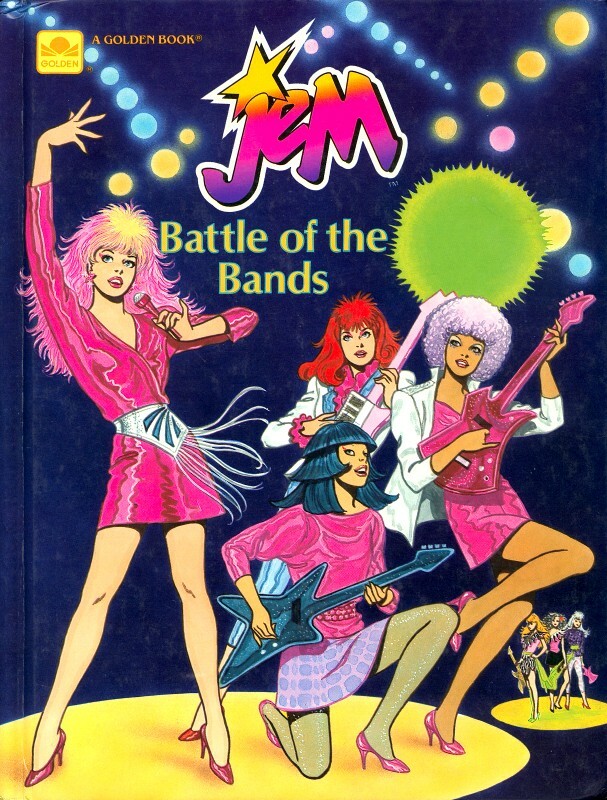 Jem and the Holograms are competing in the Top Rock Music Awards. Kimber takes skydiving lessons, and takes a limo to it. There is a fan club for Kimber. 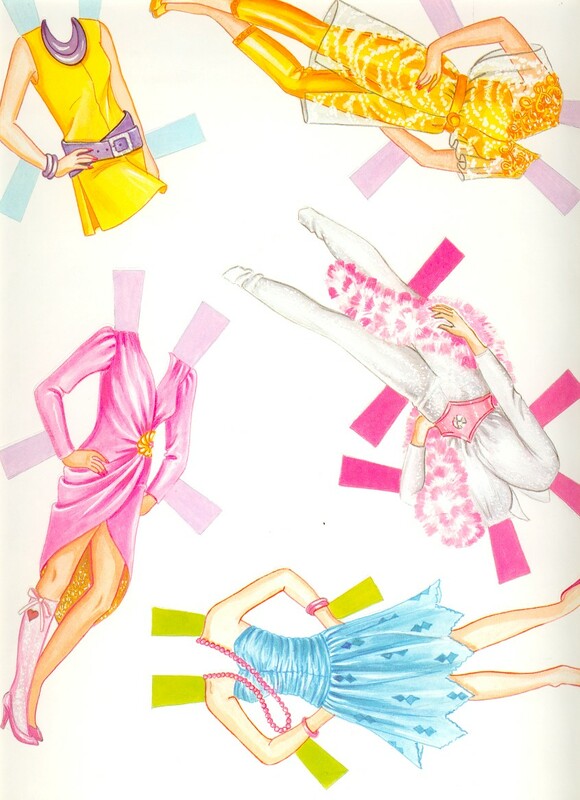 The Holograms each have different colored version of the fashion Command Performance. 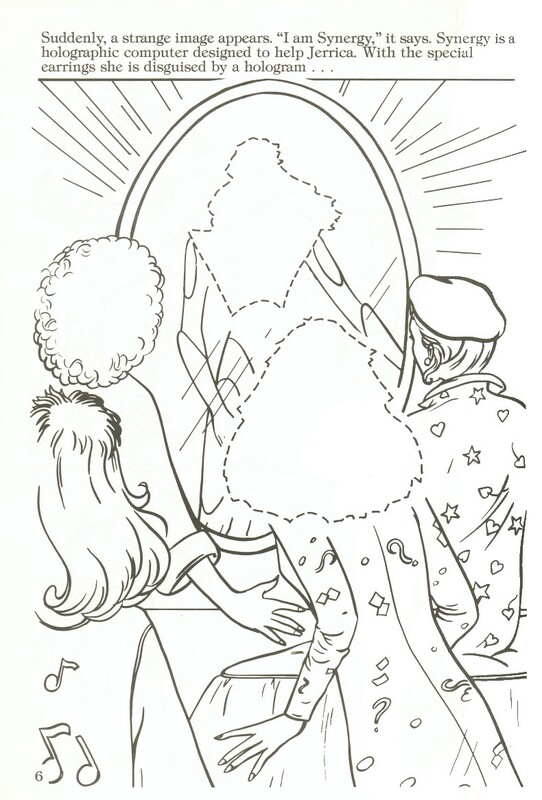 Jem's hair and makeup is being taken care of by a hairdresser, contrary to the cartoon episode Starbright part 1, where they are not allowed to touch her hair because of her holographic disguise. 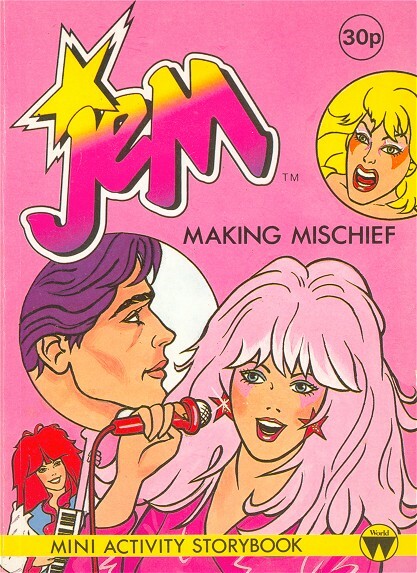 Jem's earrings are being stolen, but Jem doesn't change back to Jerrica. 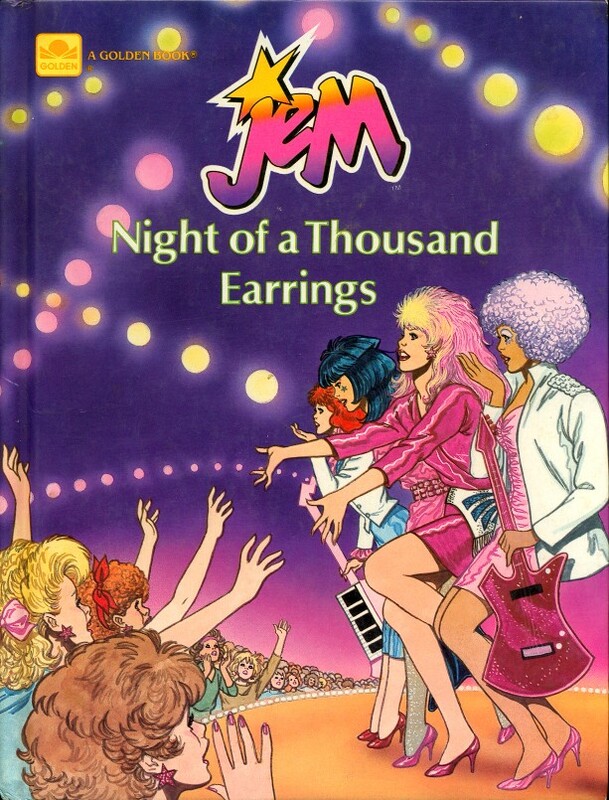 Instead the big deal is that Jerrica can't sing like Jem without the earrings. There's a rock singer named David Michael Springer who has purple hair, Aja is crazy about him and he kisses Aja on the cheek. Jem and the Holograms get an award for "creating the most exciting new look and sound in rock and roll this year". Written by Larry Weinberg. Illustrated by Tom Tierney. French title was "Le gala des Misfits". Story: Eric Raymond offers Jem and the Holograms an opportunity to help the earthquake victims in Zania, by arranging a charity concert, and they agree, unknowing of his plans to turn it into a publicity event for the Misfits. 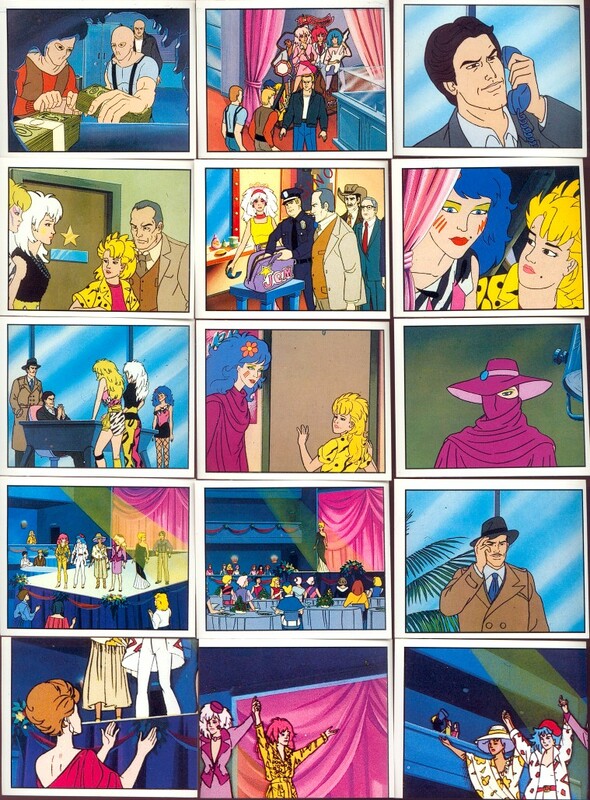 Characters: Jem/Jerrica, Kimber, Aja, Shana, Pizzazz, Roxy, Stormer, Rio, Eric Raymond, Starlight Girls (Ashley, Ba Nee, Krissie, Deirdre, Lela, Terri, Anne, Delaree...), Zipper, the mayor, and the president. The story is somewhat similar to the episode "The World Hunger Shindig", which is also about charity and Eric trying to steal the concert money by the help of Zipper. 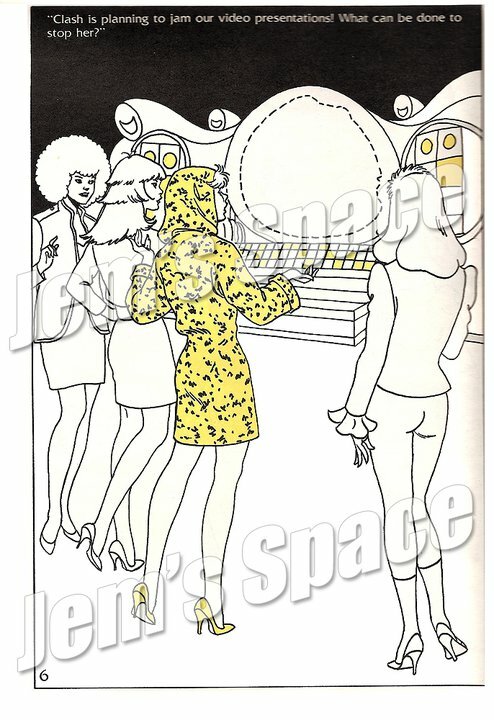 But here it is Pizzazz being locked in a room right before the concert instead of Jem, Aja and Shana. Although several Starlight girls look recognizable, some have the wrong skincolor, like Krissie and Lela. Eric is in jail but is out on parole. Zipper is referred to as Eric's right hand. There's a stadium called "Mammoth Stadium", a magazine called "Music Makers" and a newspaper called "The Daily Blurb". Stormer shows a sign of being a nice Misfit, when approving of an article that says their fans suspect their arrogant behaviour is just part of their image. 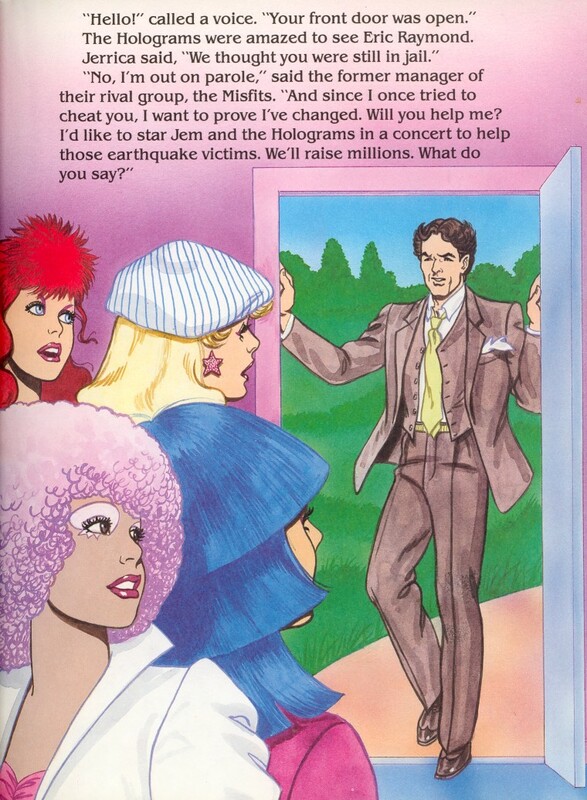 Although Pizzazz doesn't agree, she later shows a good side aswell, by refusing to let Eric steal the concert money for himself, and demands it to go to the earthquake victims. Eric locks Pizzazz in, to be able to steal money from the concert. Seems a bit out of character of Eric to do that to Pizzazz. Apparently most of Pizzazz' old pals don't have phones. Is this to suggest they are poor perhaps? Jem and the Holograms has a new charity song with the lines "This world is one world, babe, And we all know it. Could even be a fun world, babe, So let's not blow it! Up or down, Come aroun' - What's it gonna be? It's up to you and me, babe!!!". Apparently they had several new songs for this concert. These stories were also released in France by Whitman, with French titles. French title was "Mystére á la Voie Lactée". 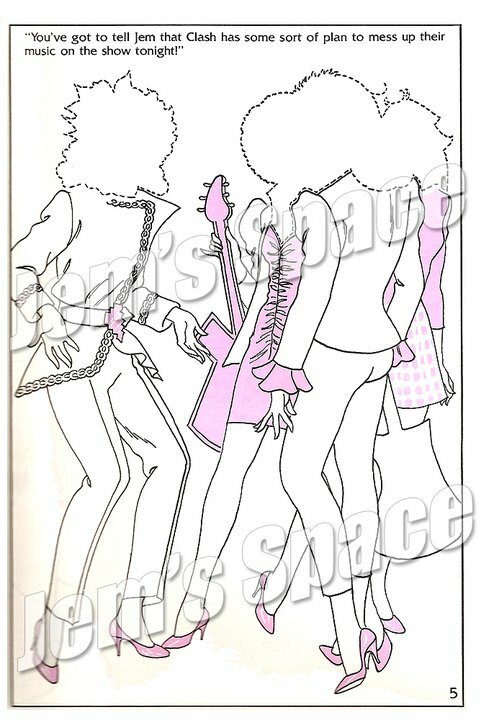 Story: Jem and the Holograms are rehearsing for the opening of the new dance club, Spangle, where a costume contest will be held for the guests. The Misfits plan to sabotage the show. 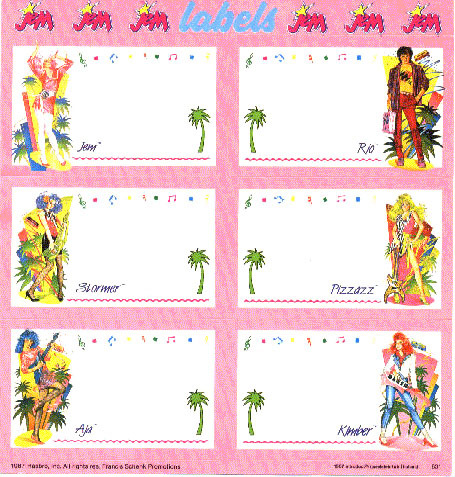 Characters: Jem, Kimber, Aja, Shana, Pizzazz, Roxy, Stormer, Rio. 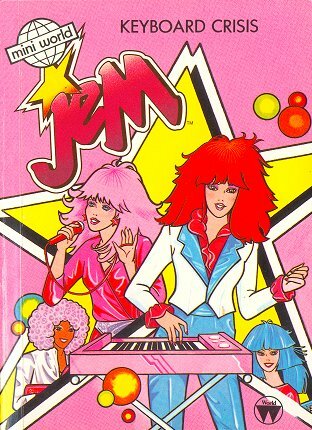 Stormer, the usually "nice" Misfit, comes up with one of the ideas of how to sabotage for Jem and the Holograms. 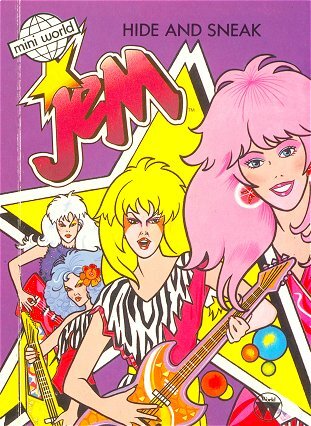 One of Jem and the Holograms' favorite songs is "She's Got The Power". French title was "Le secret de Jerrica". 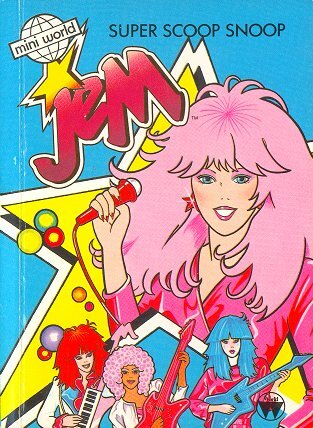 Story: Howard Sands wants to direct Jem and the Holograms in a movie about how a music video is made. And he wants Jerrica to be his assistant director. Ashley feels neglected and sneaks along to sabotage on the set. Characters: Jem/Jerrica, Kimber, Aja, Shana, Rio, Ashley, and Howard. Ashley's yellow clothes miss the triangles they have in the cartoon. 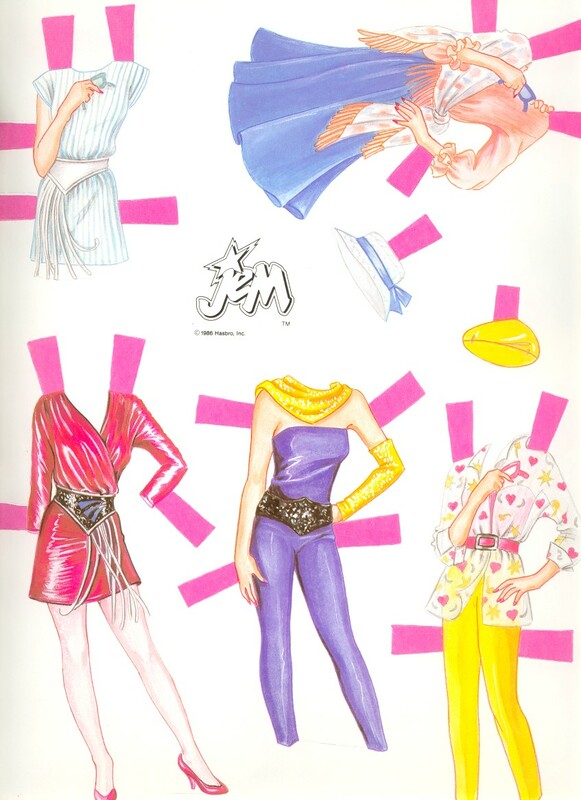 Aja and Shana are wearing different colored fashions based on the fashions released in the doll line as "Permanent Wave". 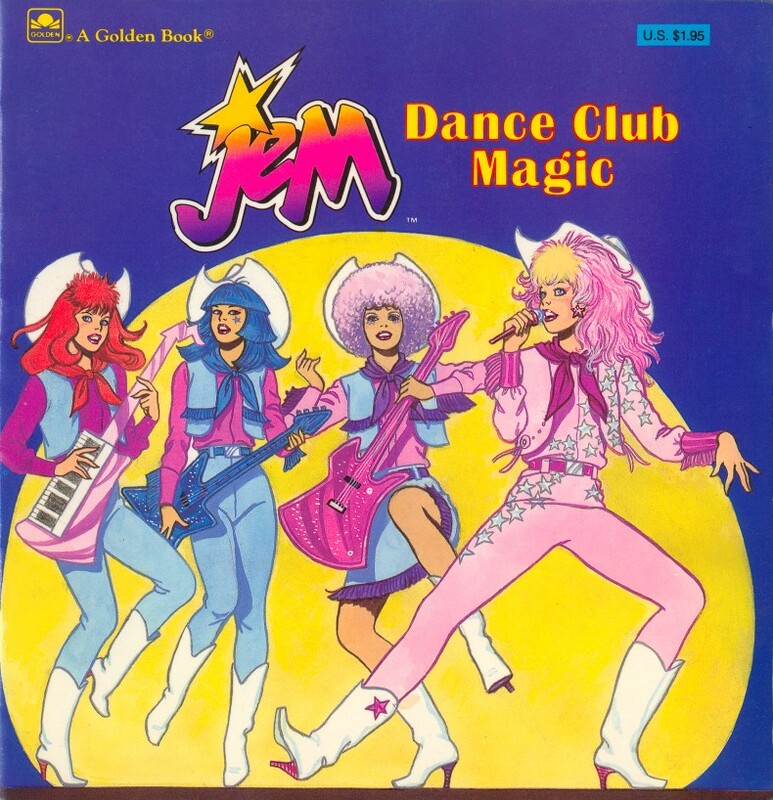 Jem and the Holograms have a song called "Magic" with one line being "...a secret kind of magic...". Story: The Holograms and Rio are all too busy to spend time with Jerrica, and through the Misfits, Jerrica finds out that he is having a party on saturday. Jerrica happens to catch Rio with an unknown woman. 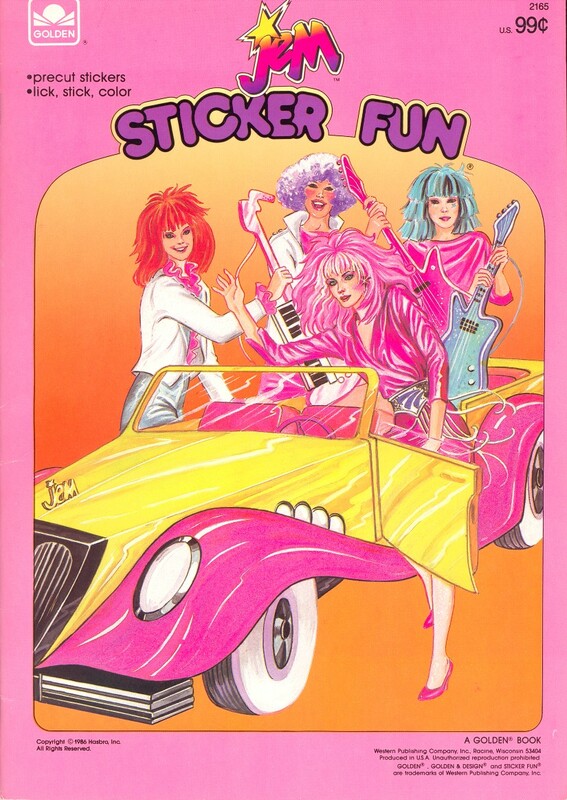 Characters: Jem/Jerrica, Kimber, Aja, Shana, Pizzazz, Roxy, Stormer, Rio, Shari West. Apparently the "Dream Team", "Hugg", "Pax" and "the Flosz", are some of the rock stars signed at Starlight Music. There are some bands called "Smash" and "Zarp". Starlight Mansion has a different kind of stairs in front of the entrance, compared to the cartoon. French title was "Tournage en Afrique". 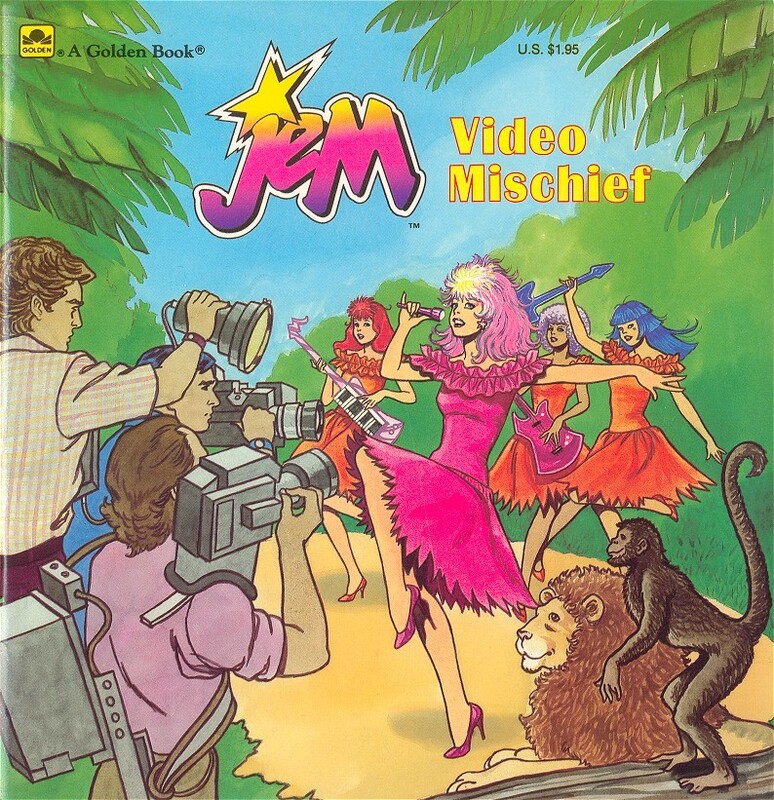 Story: Howard Sands has arranged for Jem and the Holograms to film their new animal themed music video in Kenya with real animals. The Misfits decide to go to Kenya too, in disguise, to mess up their trip. 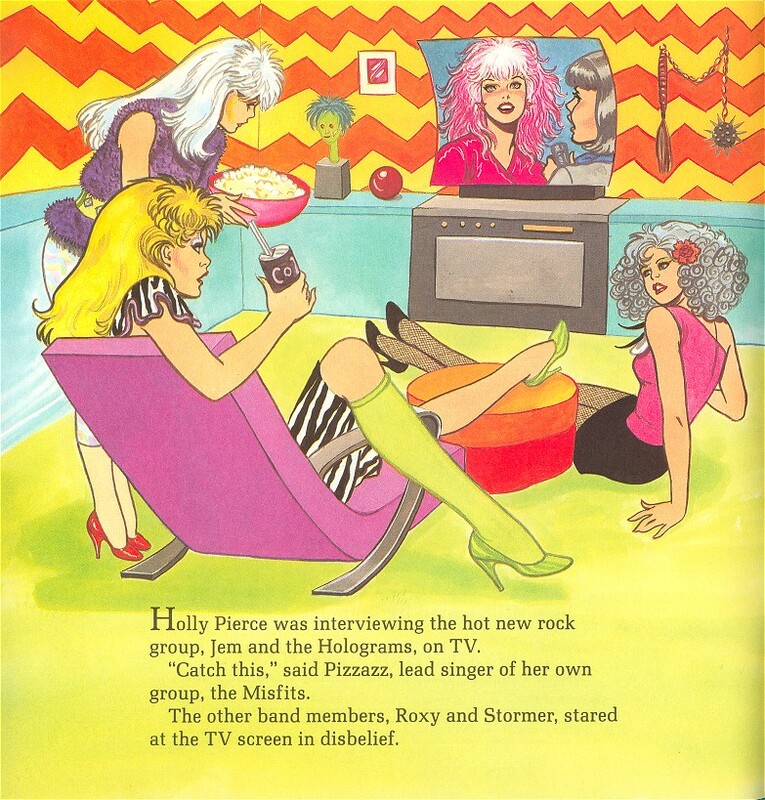 Characters: Jem/Jerrica, Kimber, Aja, Shana, Pizzazz, Roxy, Stormer, Rio, Howard, and reporter Holly Pierce. There's a reporter called Holly Pierce instead of Lindsey Pierce, but she looks nothing like Lindsey. 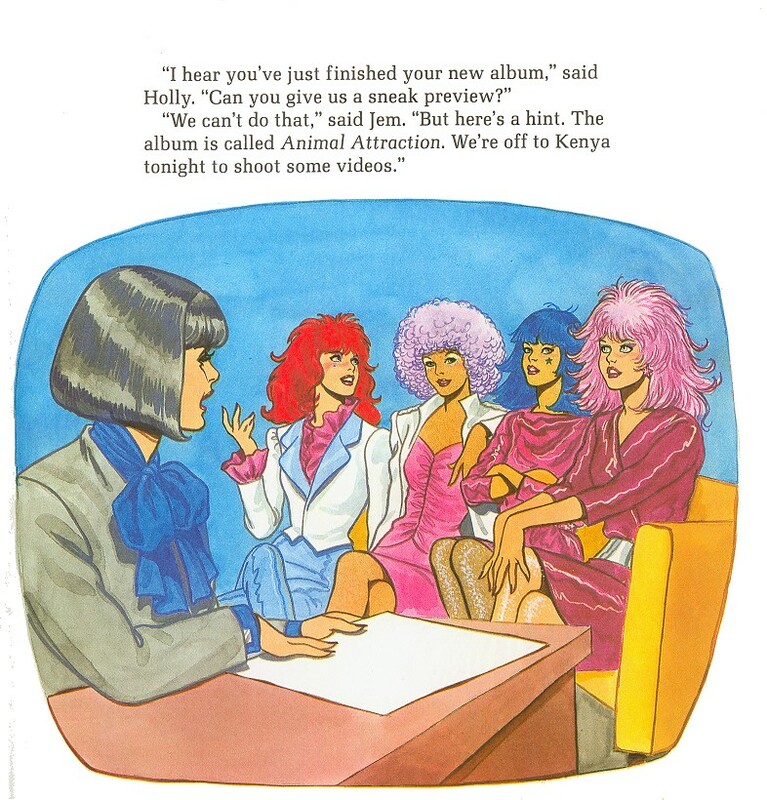 Jem and the Holograms have an album called "Animal Attraction" and they shot several videos in Kenya, Africa. 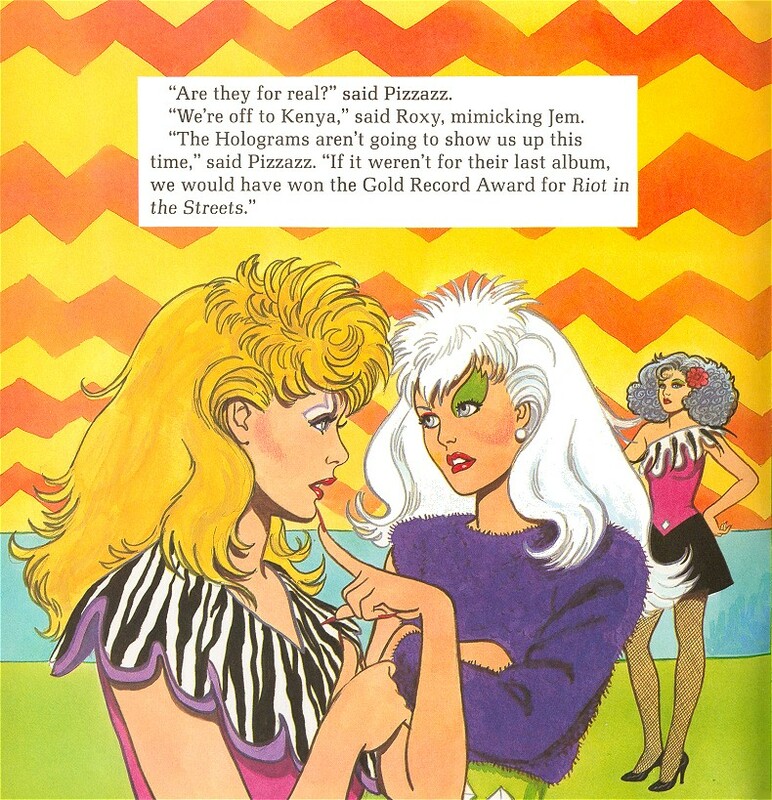 Jem and the Holograms won the Gold Record Award for their last album. The Misfits have an album called "Riot in the Streets". And this was before the character Riot had appeared in the cartoon. Howard Sands has a private game preserve in Kenya where he raises orphan animals like lions and monkeys. 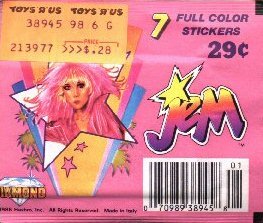 Jem and the Holograms have a song titled "Goin' Ape Over You" and another titled "Can't Take Those Lyin' Eyes" (as in Lion eyes). The idea of these books is that the reader decides between two options what Jem and the others should do, by turning to a specific page to continue the story. The only artwork in these books is the one featured on the covers, only text inside. The first two of these books contain something as unusual, for Jem books, as dedications. The last three were apparently never released but are listed at amazon.com. Written by Rusty Hallock, with the dedication "For Eric Affabee my college roommate, mentor, protégé, and friend." 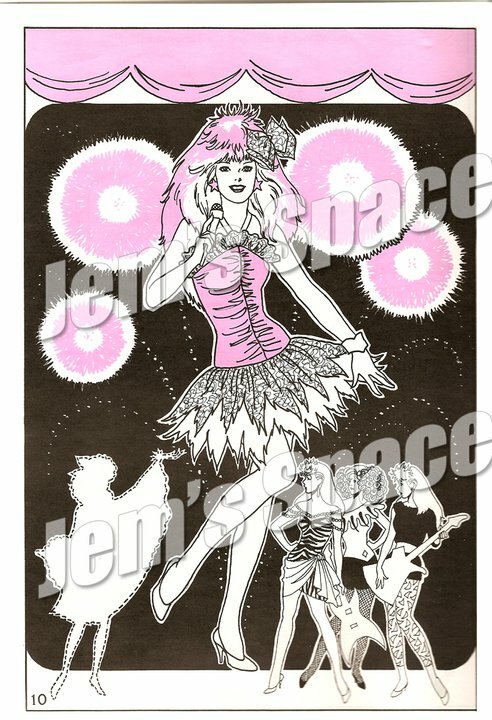 Story: Description on the back says "YOU are JEM, the super-glamorous rock star! You're in New York City for a whirlwind of parties and concerts to promote a new line of costume jewelry based on the priceless Langley jewels. But while you're modeling the real Langley jewels at a big photo shoot, the room suddenly gets black. When the light comes back on, the jewels are gone! Your rivals the Misfits, and the ruthless Eric Raymond - who'll do anything to hurt your reputation blame the crime on you! 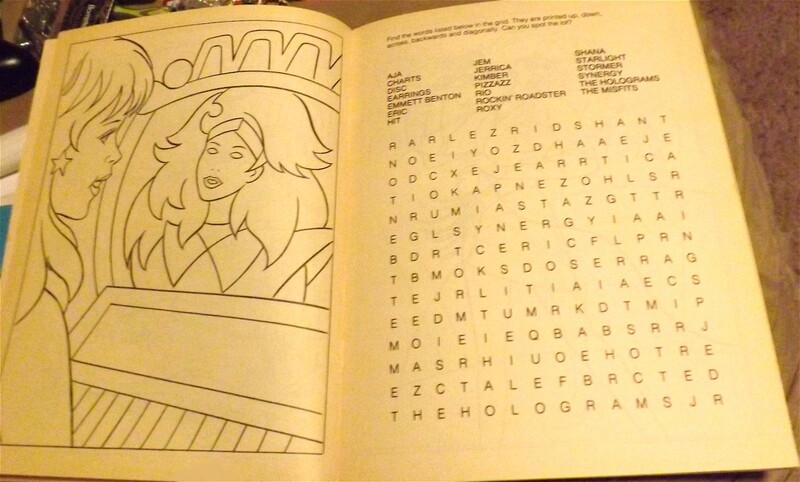 Now you and the Holograms must find the real thieves! 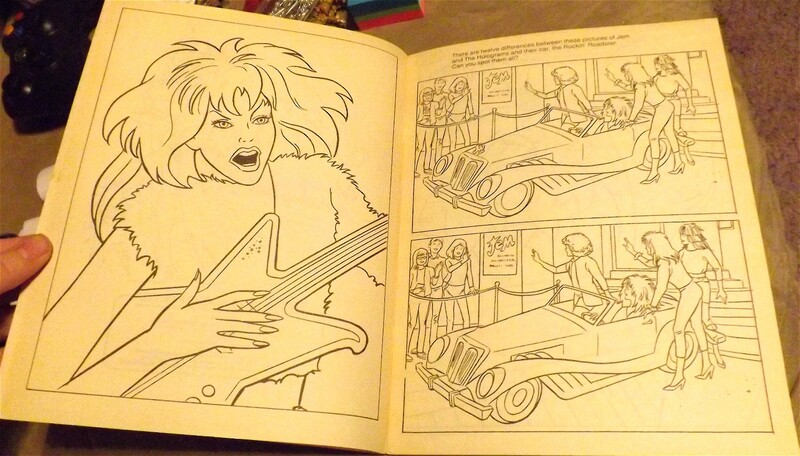 The future of the greatest rock band of all time is at stake, JEM. Your enemies are very clever, so make the right moves as you FIND YOUR FATE". 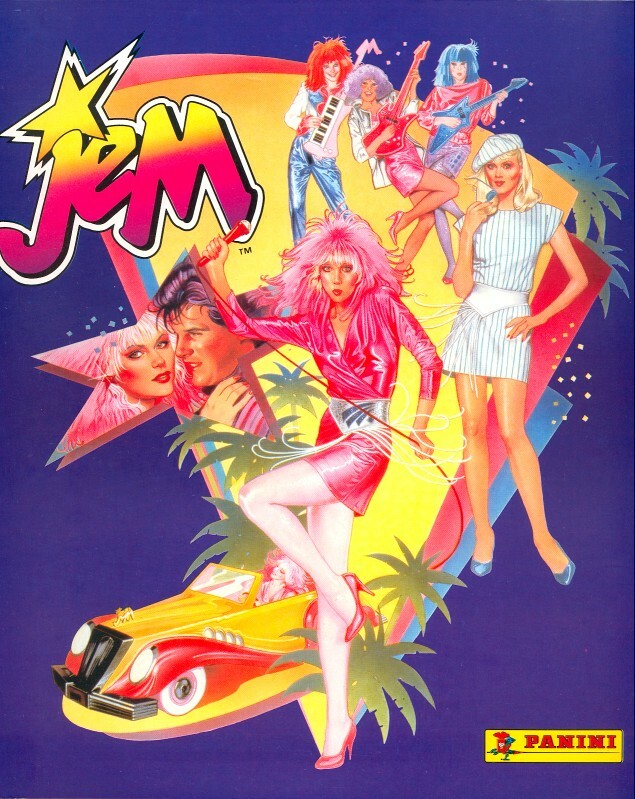 Characters: Jem/Jerrica, Kimber, Aja, Shana, Rio, Pizzazz, Roxy, Stormer, Eric, Richard Gilley (New York's top fashion photographer), Amanda (assistant), Gabriella Langley, Charles Langley, Margaret Draper, Gordon Walsh, Mrs. Hotchkiss, Dr. Mason, Lt. Henderson, David Michael Springer, Bruno, Lance Pistol, Joe Frankel, Harry Knox, and Mr. Paxton. 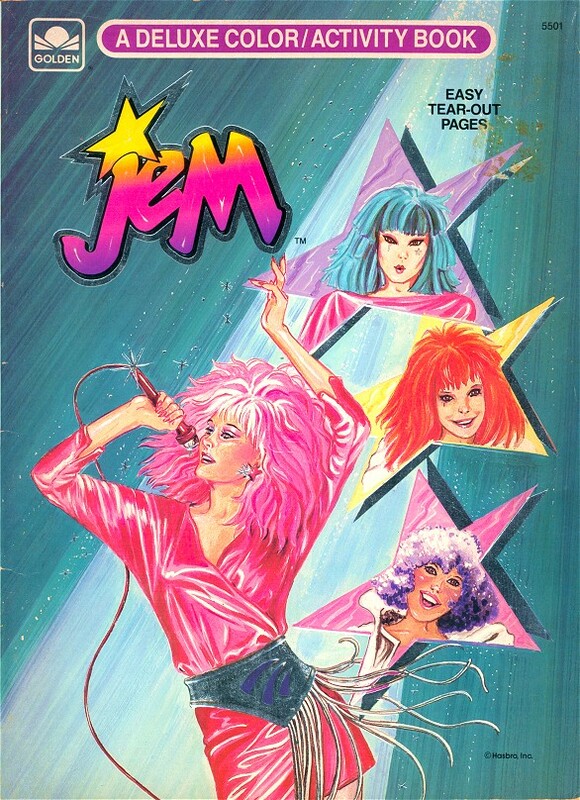 Jem and the Holograms write a new song called "It's Not Fair", and the single goes platinum in two days and the music video wins five awards. Nachos is Jerrica's favorite snack, and eating pizza in a bubble bath helps her think. Stormer is a vegetarian and says she doesn't believe in killing animals. The Misfits have a new song called "Hit Me With A Cheap Shot". Written by Jean Waricha, with the dedication "To my mother, Helen, and to the memory of my father, John." 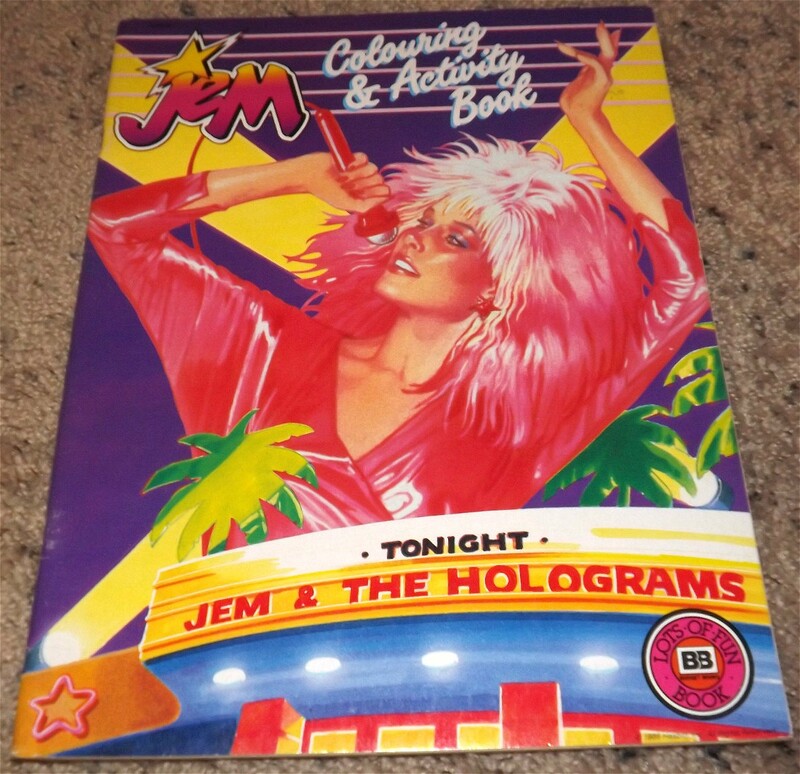 Story: Description on the back says "YOU are JEM, the fabulous and famous rock star. In London to shoot a new video, you're thrilled with your sensational wardrobe - and with the guest appearance in your video of a pretty young English princess. You and Princess Sarah become friends. She is excited about riding with you in the Rocking Roadster to the English countryside for the weekend. But when you stop to change a flat tire, the princess is kidnapped! You're sure the Misfits are behind this caper but everyone will think it's your fault. In your quest to find the princess - and save your career - you must make the right choices as you FIND YOUR FATE." 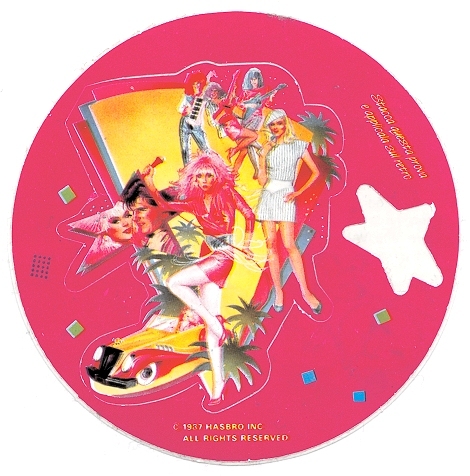 Characters: Jem/Jerrica, Kimber, Aja, Shana, Rio, Pizzazz, Roxy, Stormer, Eric, Danielle, Zipper, Princess Sarah Anne Paiget-Smith, and Candy Lane. Danielle has a home in London, England. Aja says that she wish she knew more about cars, while in the cartoon she certainly does. Kimber took an auto mechanics class in high school. Eric has a plane marked Eric Raymond Enterprises. 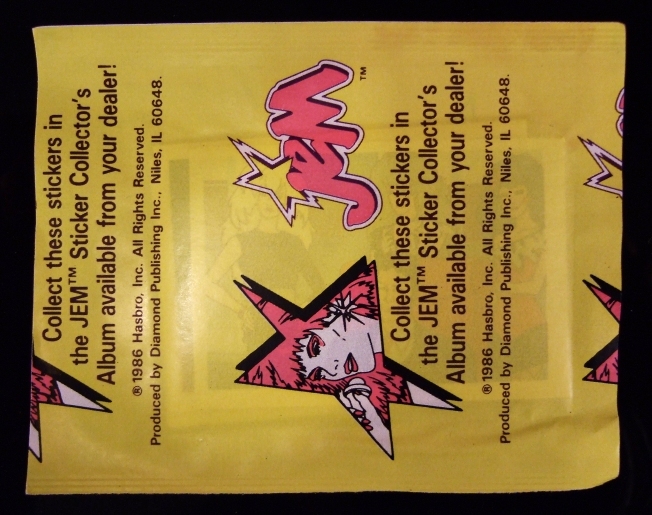 Story: Description on the back says "YOU are JEM, everyone's favorite rock star. An unscrupulous developer wants to turn beautiful Rainbow Island into a tourist trap and your friend Samantha, whose father owned the island, needs five million dollars to save it. You and the Holograms are eager to help - and everyone has ideas. Should you throw a big benefit concert called Rainbow Aid? Should you write a song about the island and give the money it earns to Sam? Or should you rush down to Rainbow Island and try to thwart the developer's plans yourself? The future of a little piece of paradise is in your hands, JEM, so do your best as you FIND YOUR FATE." 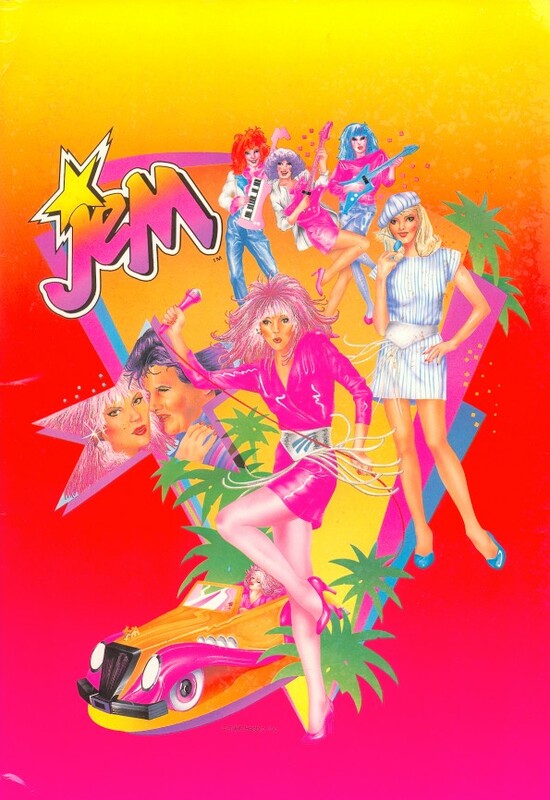 Characters: Jem/Jerrica, Kimber, Aja, Shana, Rio, Pizzazz, Roxy, Stormer, Eric, Howard Sands, Zipper, Starlight Girls (Ashley, Ba Nee, Joellen), Samantha Walker, Brad Turner, and Edwin LaRue. One of Jerrica's favorite songs is "Like A Dream". Jerrica and Kimber's father took them to Rainbow Island every year when they were kids. Jerrica is mentioned to have violet eyes. Synergy projects a hologram of a ghost ship, which is the one seen on the cover art. Aja wants to design costumes for a show, and Shana takes charge of the choreography. In the cartoon, Shana is the designer, and Danse takes care of the choreography. Kimber has written a new song that is a fast-tempo upbeat number titled "Rainbow Runner" and gets nominated for Best Video of the Year, the first line is "I'm always chasing rainbows", and the rest of the lyrics goes "I want the rainbows to shine, and the seabirds to soar, and my song to sing over, the blue ocean's roar, I'm a rainbow runner a rainbow runner, Rainbow's Island is my heart's true home, I'm a rainbow runner a rainbow runner, its beauty is with me wherever I roam". 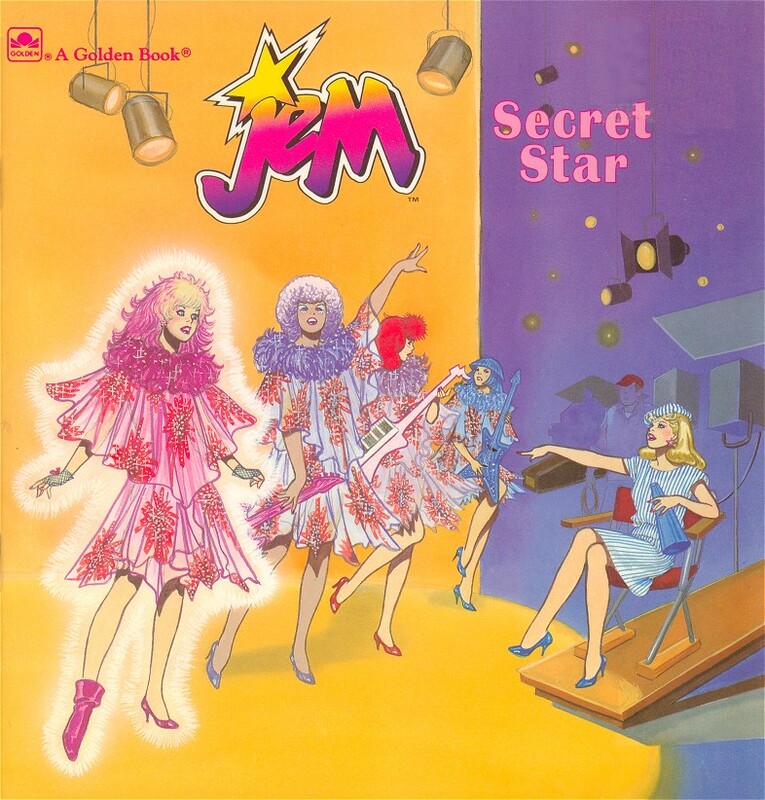 Jem and the Holograms have a song called "Just You And Me, Under The Sea" (yeah this was long before Disney's "The Little Mermaid" of course). 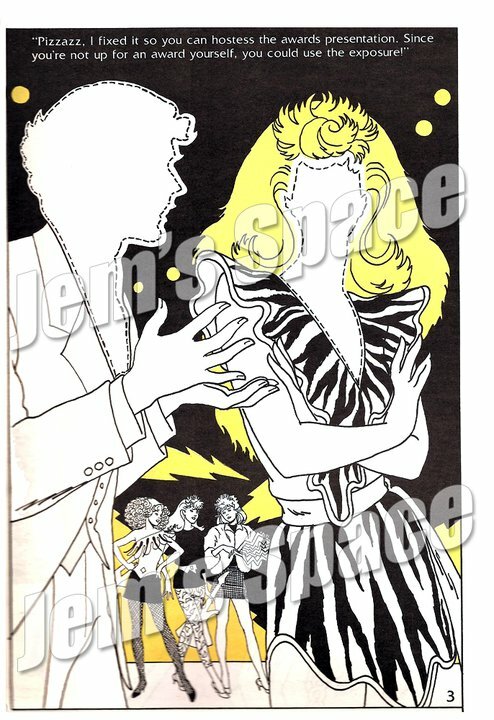 By the help of holograms, Jem makes the stage an underwater wonderland with tropical fish swimming around them and beautiful sea plants swaying back and forth to the beat of the music, which makes you wonder what Rio and the other people behind the scenes would think about the special effects. Jerrica neatly tucks her pink hair under a fashionable red beret and changes her concert clothes to a sleek black dress, so apparently sometimes Jem does litterary change into Jerrica like the doll. Rio has a friend called Brad Turner with blonde hair and green eyes, who is the best video producer in the business and offers to make a video of Kimber's song. Aja thinks he is quite a hunk and Jem agrees. Aja says that maybe she can spray her hair all the colors of the rainbow. So maybe that means they actually spray their hair to get those colors, while in the cartoon they seem to be their natural colors. Ba Nee is called "Bonnie" and Joellen "Joelle". Stormer heaves a big rock at Rio's head and he drops face down in the sand. Not the Stormer we are used to in the cartoon. The Misfits' music is refered to as Rock/Pop/Punk. The Misfits have a new song called "Road Rocker". Small storybooks, sold with a cassette where the story is read by different actors. Eric still owns half of Starlight Music in these stories. 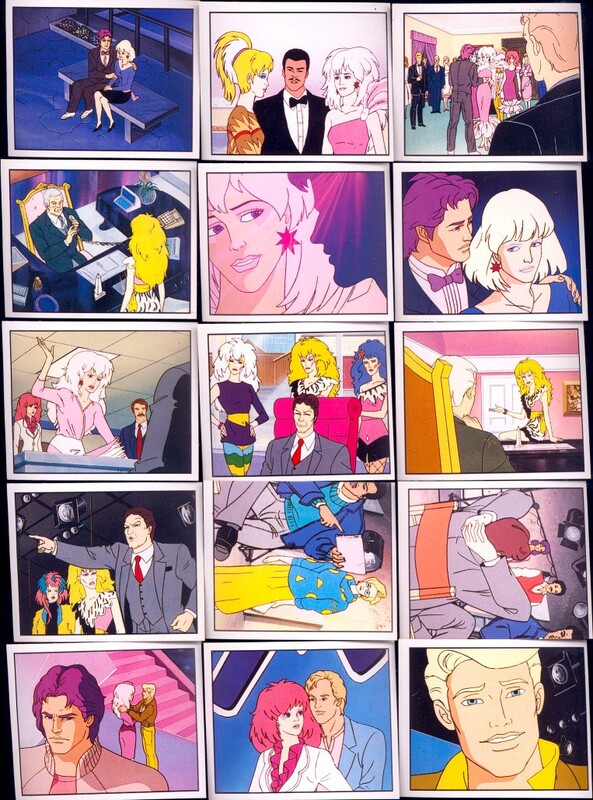 The instruments of the Holograms and the Misfits look like the doll versions, except for in Keyboard Crisis where Kimber has a pink keyboard on a stand similar to the cartoon. 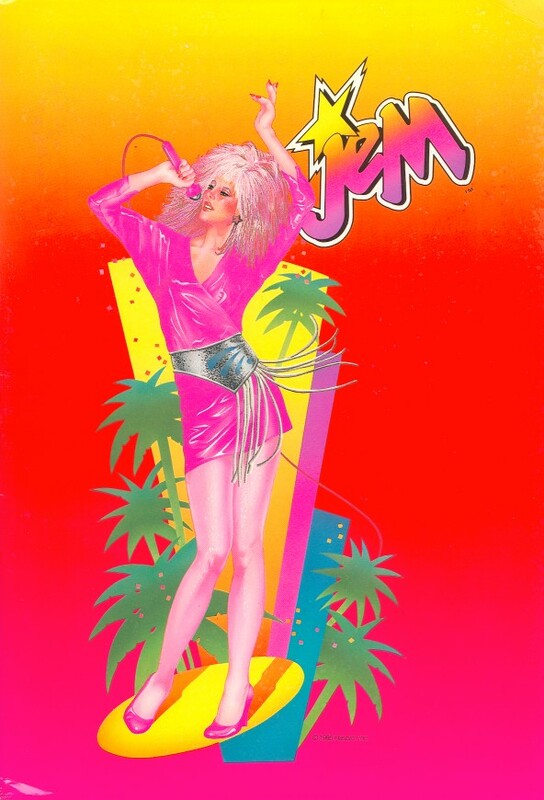 Story: Eric plans to "borrow" the tapes of Jem and the Holograms' new single, to record the song with the Misfits and released it first, so that the media will think of Jem and the Holograms as copycats when they release theirs. 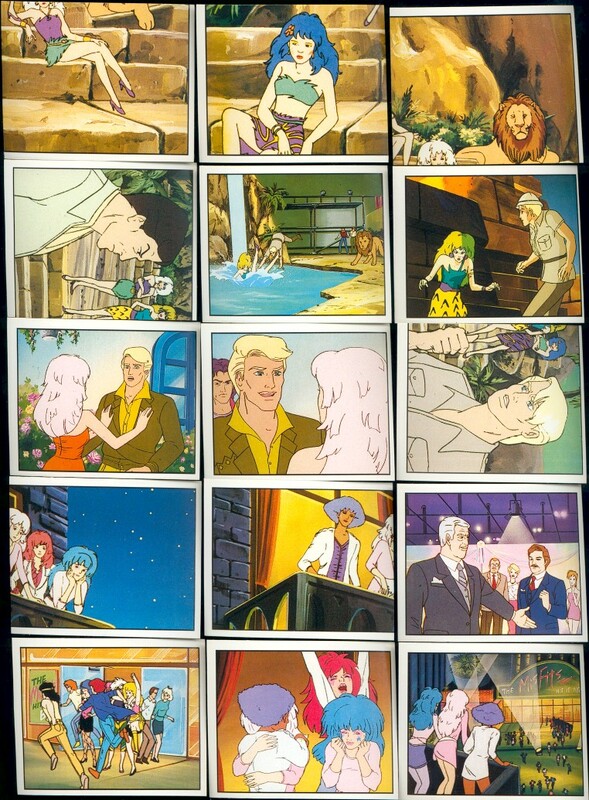 But Jem and the Holograms stumble upon a cat which turns the luck around for them. 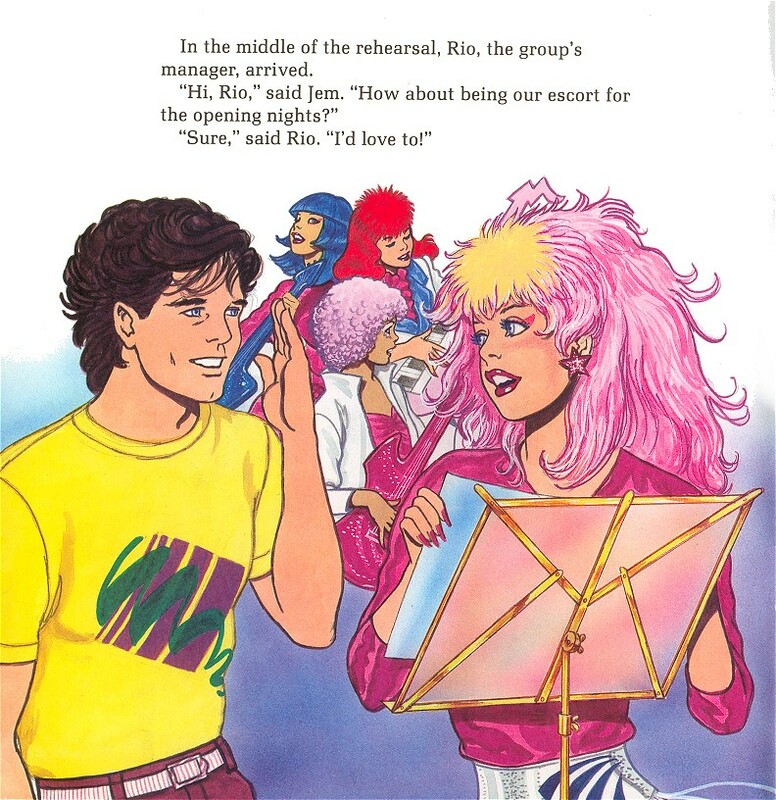 Characters: Jem/Jerrica, Kimber, Aja, Shana, Pizzazz, Roxy, Stormer, Eric, and Rio. The Misfits are described as lousy music-wise. This story is a bit like the cartoon episode "In Search Of The Stolen Album". Jerrica is wearing the hat from the doll outfit, and blue and white striped dress. There's a TV-show called "the Jerry Carson Show". Eric can't stand cats, he's terrified of them. The roadster is included in this book. Story: The Misfits offer Jerrica to join the Misfits, hoping to keep her from spending time supporting Jem and the Holograms. When the Misfits get a hold of the Jemstar earrings, Jerrica decides to accept the offer. 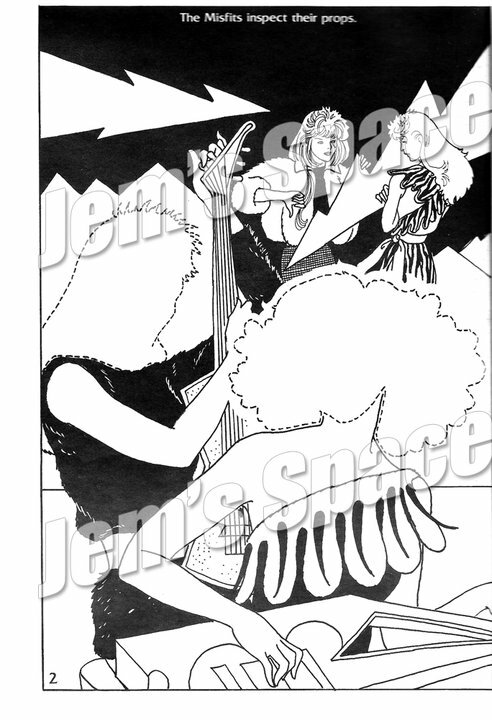 Characters: Jem/Jerrica, Kimber, Aja, Shana, Synergy, Pizzazz, Roxy, Stormer, Eric, and Rio. Jerrica is offered to join the Misfits as part of the group. She accepts, and they give her a Misfits make-over. There's a presentation ceremony for rock and pop awards. Jerrica calls the Misfits the worst band of the year. The Misfits finally recognize that Jerrica is wearing the same earrings as Jem. Which they never seem to realize in the cartoon. Jerrica can't play any musical instrument, and according to Pizzazz, neither can any of the Misfits. Rio suggests that Kimber takes over the vocals when Jem is gone, but Jem makes fun of Kimber's vocal ability. Story: Kimber hasn't been herself recently, the others find her playing guitar and singing some unknown songs in the early hours of the morning, booking a recordning studio for herself, and sneaking away for a meeting with another record company. Rio sprained his ankle and won't be able to set up for the evening concert, and Eric pays the replacing road manager to make sure that the concert doesn't happen. Characters: Jem/Jerrica, Kimber, Aja, Shana, Synergy, Rio, Chris Andrews, Eric Raymond, Alan, and Pete. The audio speaker playset Rock Backstager is seen in this book used as an actual audio speaker. The head of the Starlight recording studios is someone called Alan, and Aja likes him. Kimber plays on Shana's guitar. We get to see Starlight House. 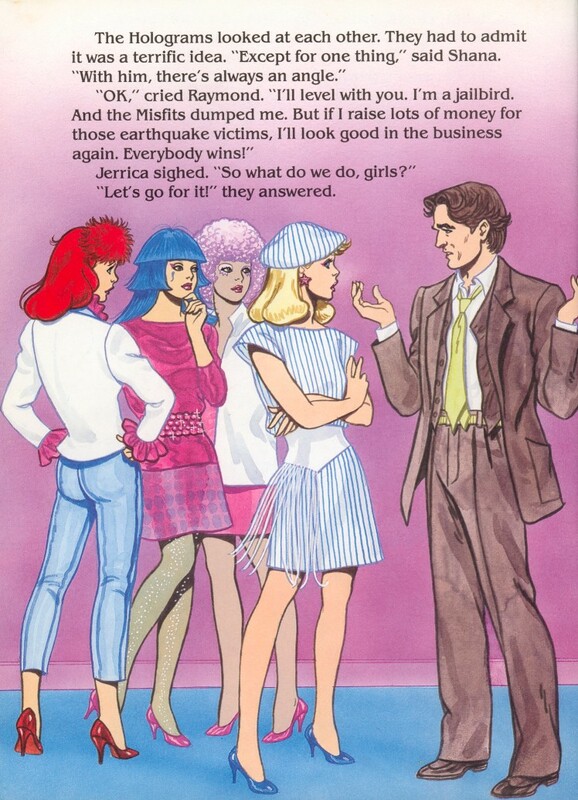 Story: Pizzazz makes Eric give her cousin, who is a reporter, a job in the Starlight offices to pretend to be a secretary while she is really trying to find out who Jem really is. 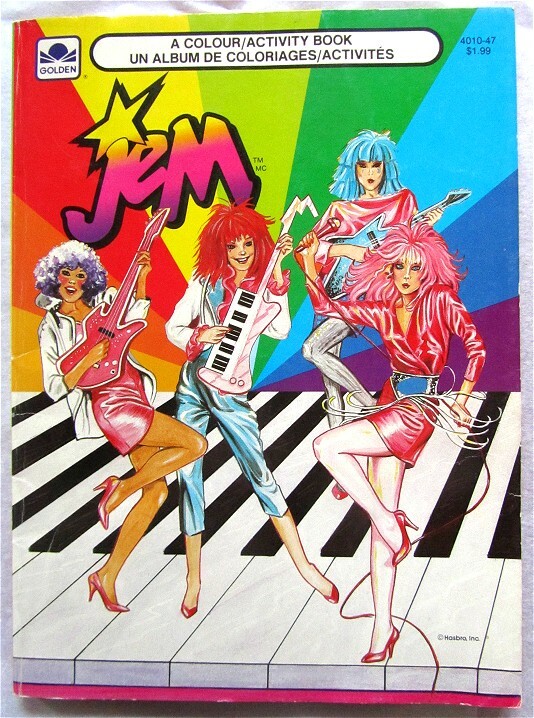 Characters: Jem/Jerrica, Kimber, Aja, Shana, Pizzazz, Roxy, Stormer, and Patti Paine. 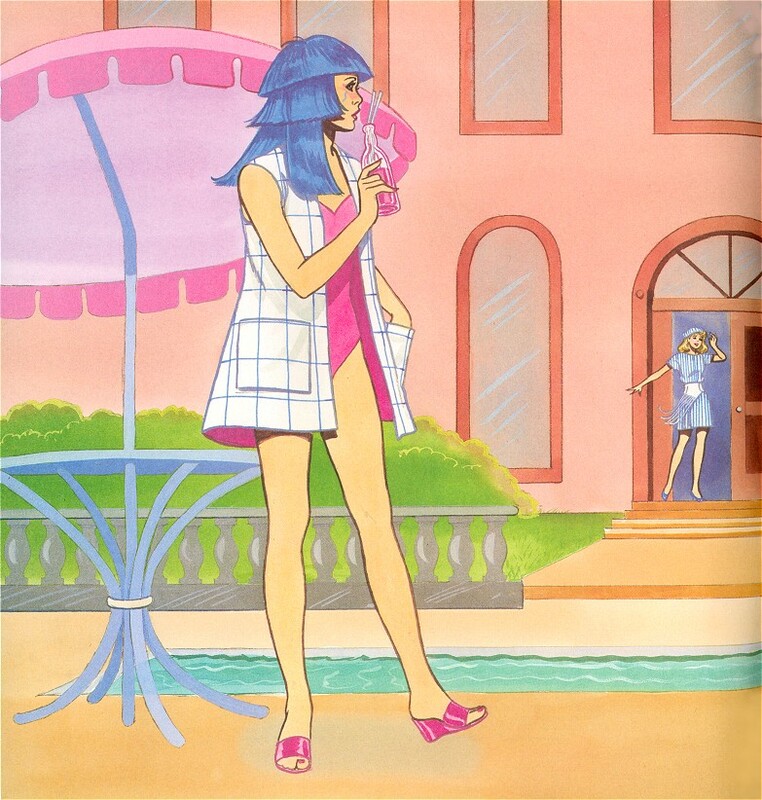 While not mentioned in the cartoon, Pizzazz has a cousin called Patti Paine who works as a reporter. Pizzazz is called a blonde. Hardback books that are larger than the Mini World books. World also released books for My Little Pony, Ghostbusters, Enid Blyton, Wuzzles, and Fireman Sam. A funny note, in these books Shana has a bow in her hair, like the doll does. Story: Description inside says "Donna Maddon is a bad mannered brat. 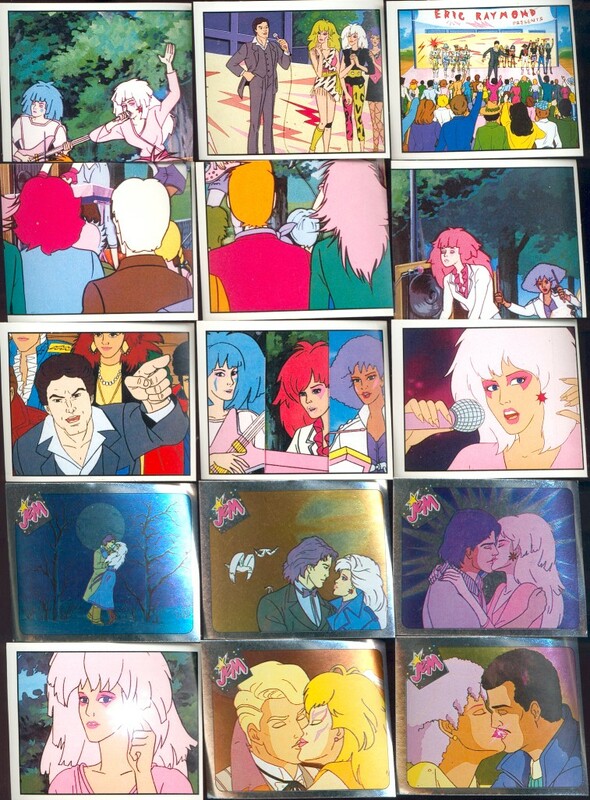 Somehow, she wins a kids' talent contest and gets to meet Jem and The Holograms". 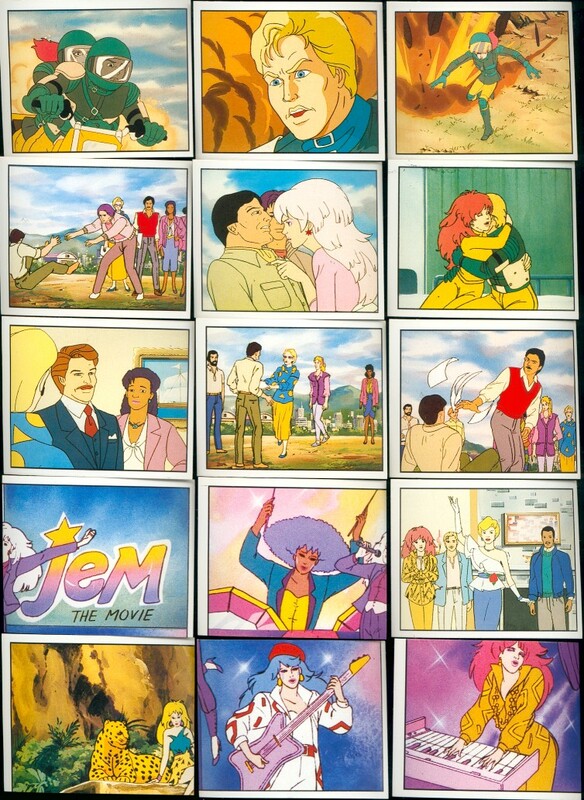 Characters: Jem/Jerrica, Kimber, Aja, Shana, Rio, Eric Raymond, and Donna Maddon. One at the time Jerrica wears both versions of her regular outfit, pink/blue striped and white/blue striped. The Holograms and the Misfits' instruments are the doll versions. Story: Description inside says "Millionaires....mansions....fast cars....family feuds. Jem joins the jet-set dream world when she is asked to take part in a top rating TV soap opera.". Characters: Jem/Jerrica, Kimber, Aja, Shana, E T Earwig, B B Badd. Jem says she can't act. 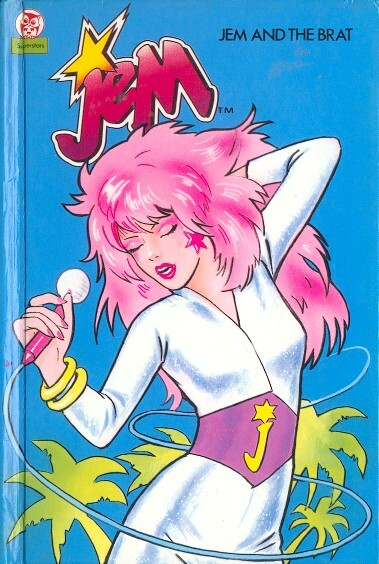 While in the cartoon, she does in the cartoon episodes "Starbright" trilogy aswell as "Hollywood Jem" two parter. Story: Description inside says "Eric Raymond wants to turn some kids out of the building used for a youth club disco. How can Jerrica Benton and Jem stop him?" We get to see Rio's van. The Holograms and the Misfits' instruments are the doll versions. Story: Description inside says: "A dream cruise turns into a nightmare when the world famous Van Diore diamonds are stolen and Jem is the chief suspect!". 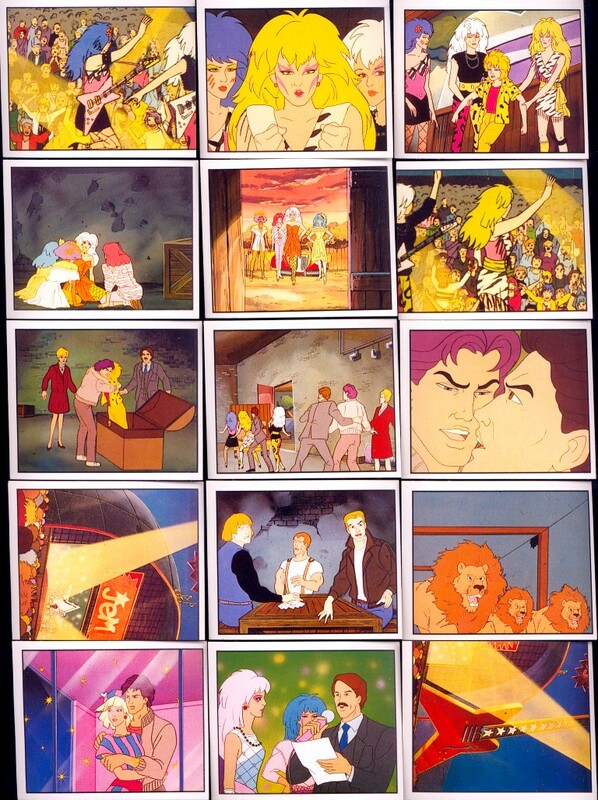 Characters: Jem/Jerrica, Kimber, Aja, Shana, Rio, Captain, Gloria Van Diore, Henrich Voltmann, and Walter Kramner. Jerrica and Rio are wearing the cartoon version of their original outfits, and at the same time Jerrica has the longer hair which she, in the cartoon, never had in combination with that outfit. 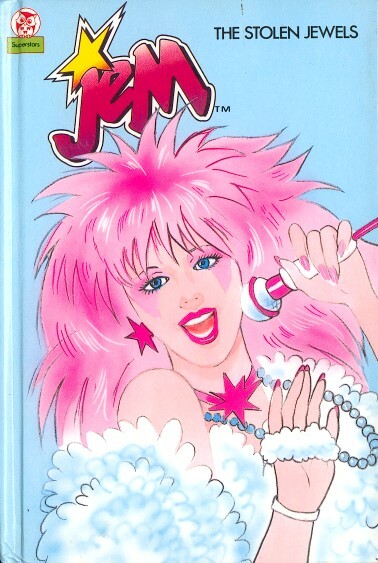 Jem calls Pizzazz a "clown", which I guess might be a expression used in the UK instead of "silly". 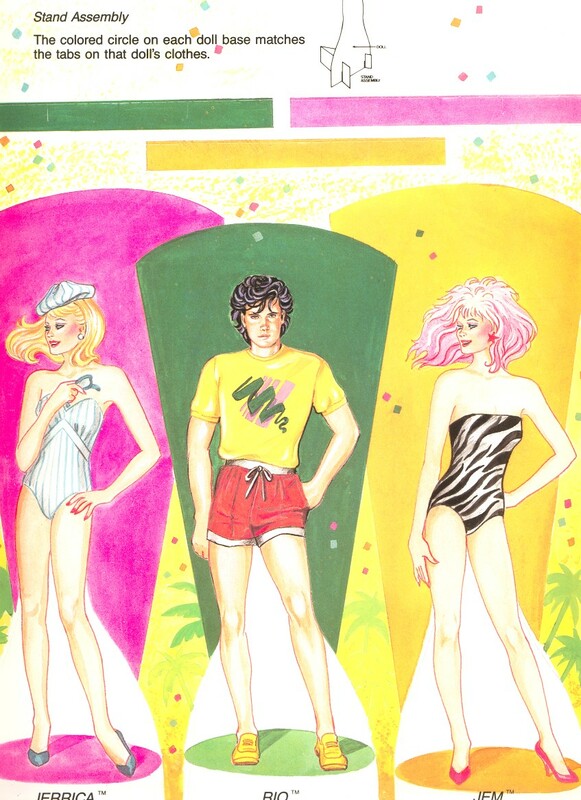 Jem is wearing the fashion "Permanent Wave" which is Kimber's outfit in the cartoon. Instead of "Show's over Synergy", Jerrica says "Holograms off". Books released annually, but only in 1987 and 1988, and a built up like a magazine, with more fun features than just stories. Some of the stories inside atleast the first annual, were also released on cassettes. The second of these books is especially interesting since it features second year characters like Raya, which means it was one of the books that were last released of all Jem books. Some of the stories in these, were released in magazine shape in Germany. 64 pages. 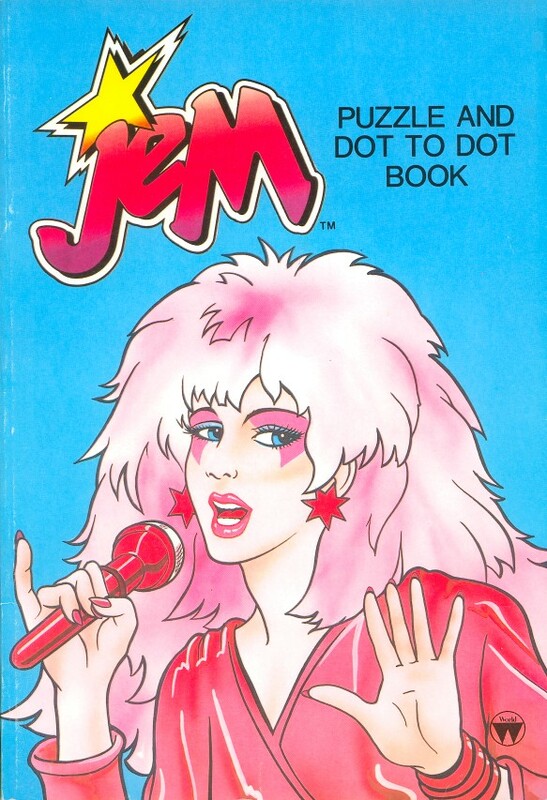 With character descriptions of Jerrica, Jem, the Holograms, Eric Raymond, and the Misfits. The stories "Stage Management", "Marbo The Rock Movie", "Two-Timing", "Rockin' Roadsters". 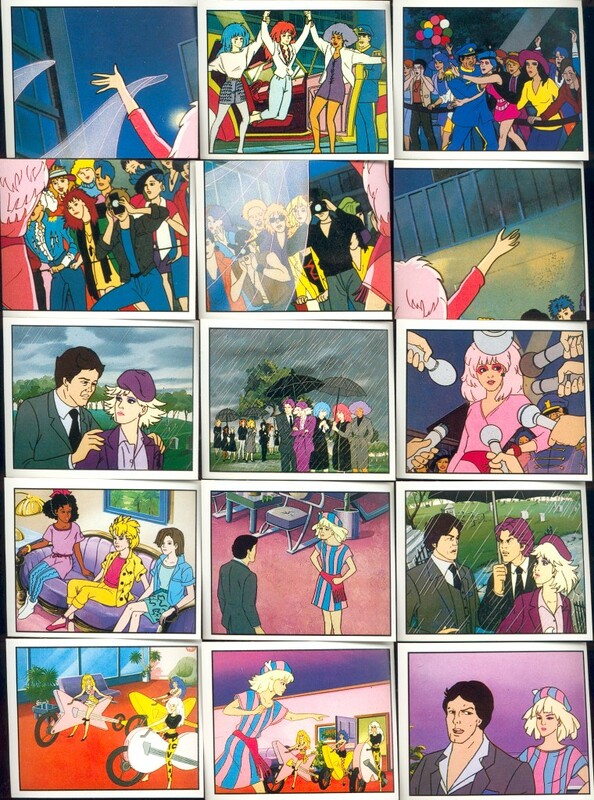 The comic book style stories "In the Beginning" and "Desperately Seeking Synergy". 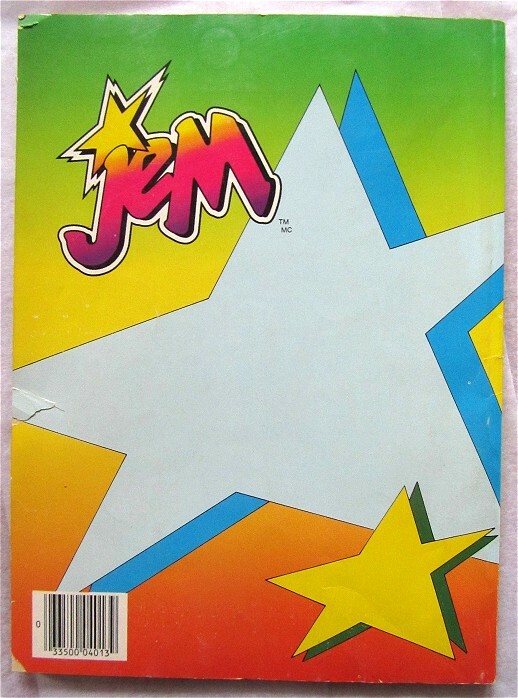 Also pages that aren't directly about Jem, the Horoscopes page "Starry-Eyed! ", "Jem's Exercise Routine", "Here's Looking at you" about your looks, "Jewellery Gems" shows how you can make your own jewellery cheap. Characters: Jem/Jerrica, Kimber, Aja, Shana, Pizzazz, Roxy, Stormer, Rio, Eric, Synergy, Howard, and the Limp Lizards. Rio has brown hair, Mrs. Bailey has red hair, Eric's secretary has purple hair, Eric has a bit of white hair on the sides, and Howard has a moustache. 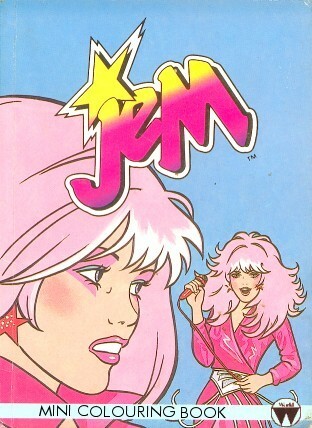 In one story Jem is completely out of character and acts very mean, without explanation. The Misfits have a dark, sleek cadillac called "Dark Demon", with a ornate design on the bonnet on the motor, making it resemble an unpleasant grinning face. 64 pages. Contains mostly stories and character descriptions. Starting with the page "The Beat Goes On" there are character descriptions of Jerrica and Synergy, Jem, Kimber, Aja, Shana, Raya, Danse, Video, and Rio. Then there's "A Message From Mr. Raymond..." introducing the Misfits including Clash. The stories "Night Of The Dolphins", "Queen For a Day", "Prince Rat", "Playing with Fire", "Gold Gets Going". The comicbook style stories "Higher And Higher! ", "Two Kinds Of Courage". And a page about how Jerrica keeps her hair and face in shape "She's A Natural". Characters: Jem/Jerrica, Kimber, Aja, Shana, Raya, Pizzazz, Roxy, Stormer, Clash, Rio, Eric, Synergy, Danse, Video, the Starlight Girls, and Zipper. Appears to be the only book that includes Raya, strangely it doesn't mention Jetta aswell. It says that as a dancer, Shana is great. Danse is introduced as a member of the group, and Clash as one of the Misfits. Clash has purple hair, like she did after the change in the cartoon. In some of the stories Eric has a bit of white in his hair on the sides. When asked about his swimming, Zipper answers that his daddy was an electric eel and mommy was a great white. Zipper has noticably longer and red hair, instead of blonde or dark brown as in the cartoon. The song "Only The Beginning" is called "In The Beginning". There's a brunette Starlight Girl named Jacqueline Houghton called "Jack", a blonde called Dizzy, a Mary, Janet, Clare, and a Sue. 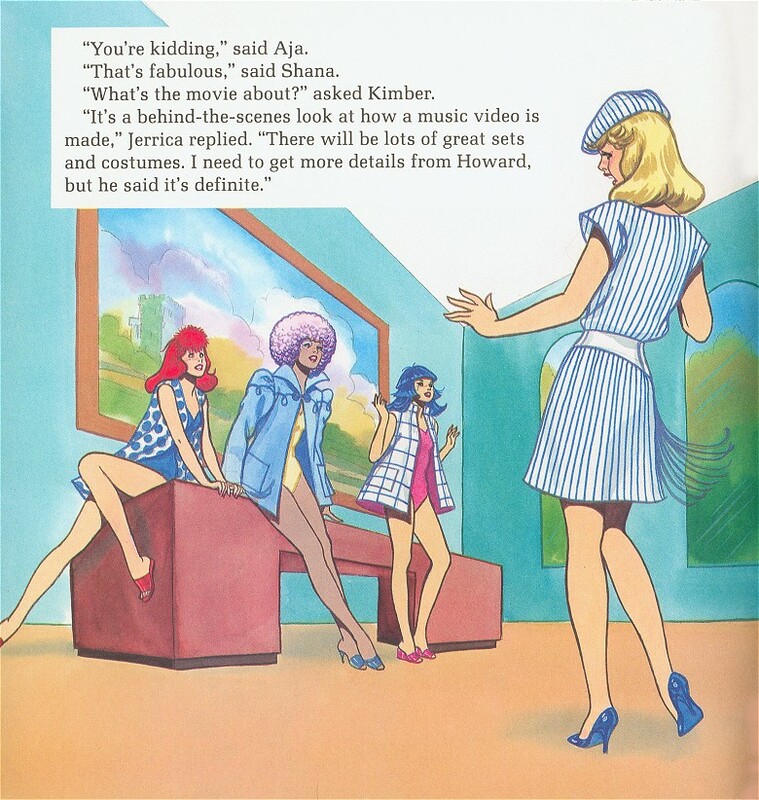 After being asked by a Starlight Girl, Rio replies that he never really thought about that Jem and Jerrica look alike, contrary to the episode "Broadway Magic" of the cartoon which takes place before this story, and was released on video in the UK where these books were made. It's mentioned that not long after Jerrica's father's funeral, Rio swore that he would love Jerrica forever, although that was never seen in the cartoon. The Holograms, including Raya, still live in Starlight House. Raya never even saw that house in the cartoon. Starlight House is accidentaly set on fire by Zipper in the middle of the night after Eric asked him to steal some backing tapes, but the house is saved. Stormer gives the Holograms the new nickname "Horrorgrams". The song "It Depends On The Mood I'm In" gets a slightly different title "Depends On The Mood I'm In". 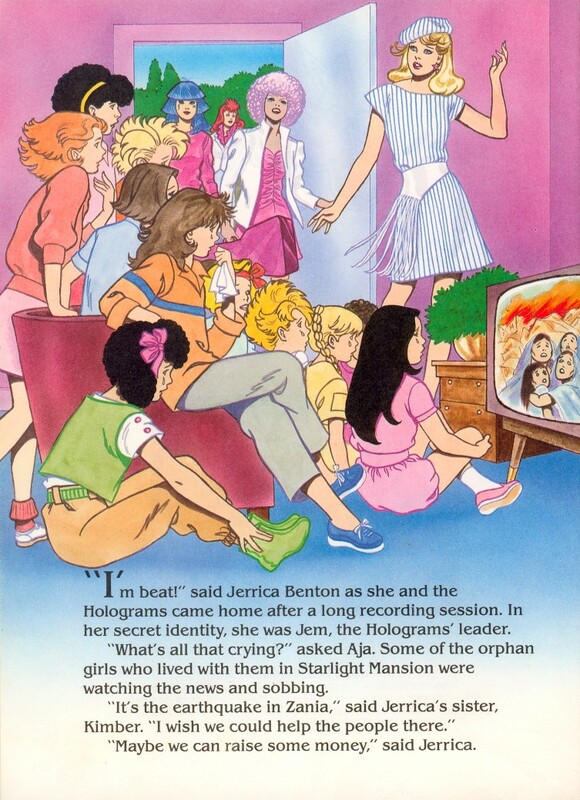 Jerrica and Jem and the Holograms get another nickname by Pizzazz, "Miss High and Mighty Jam and her precious little Marshmallowgrams". 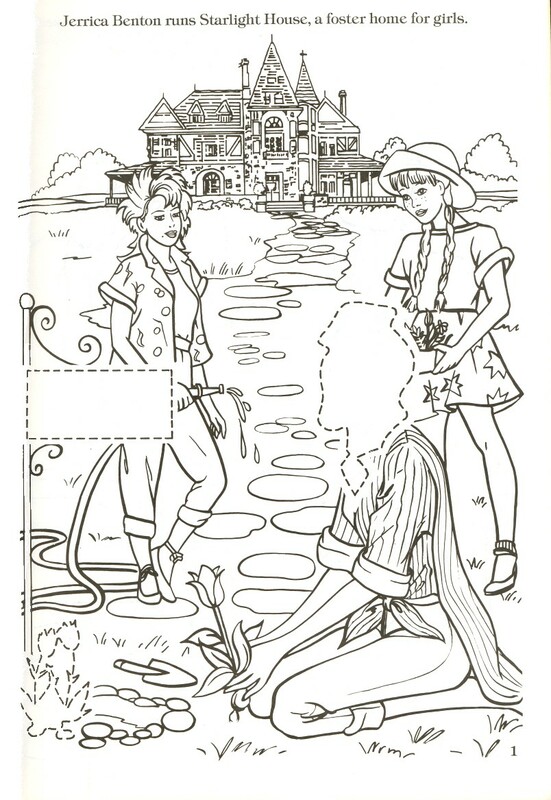 Coloring pages, and other activites such as mazes, dot to dot, paper dolls, spot the difference, word games. Some of them even contain simple stories. Some features like these appear in the comics and other books aswell. 60 pages with mostly stories to color. Characters: Jem/Jerrica, Kimber, Aja, Shana, Rio, Pizzazz, Roxy, Stormer, Krissie, Ashley, Ba Nee, Joellen, Delaree, Deidree, and Marianne. Shares some pages with both the "Deluxe Color/Activity Book". Misfits' House, Rockin' Roadster, Starlight Express and Misfits van is featured. Shana plays guitar instead of drums. Rio drives the Rockin' Roadster, which never happened in the cartoon. 60 pages. 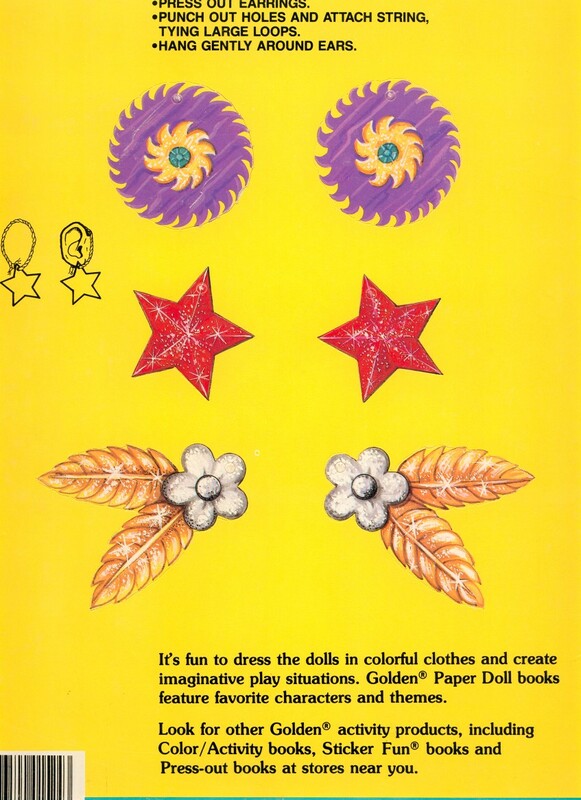 Contains coloring pages, paper dolls, dot ot dot, mazes and other games. The Rockin' Roadster, and Stormer's guitar-shaped motorcycle is featured. Shana is playing guitar instead of drums. The Holograms are very clearly featured with their main interests, Kimber = writing songs, Aja, Working out, Shana designing clothes. 140 pages. Contains stories, paper dolls, and other games. 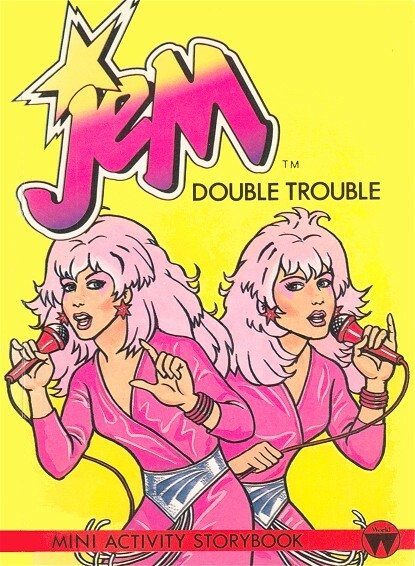 Characters: Jem/Jerrica, Kimber, Aja, Shana, Rio, Synergy, Pizzazz, Roxy, Stormer, Lela, Terri, Krissie, Becky, Delaree, Ba Nee, Ashley, Deidre, Joellen, and Marianne. There are some song lyrics of a new Jem and the Holograms song "I live life in the fast lane, and gaze through windowpanes, there's little time in a day, ...we may, we'll stroll down dream street, and start kickin' the upbeat, I love the glitter and lights, but sometimes it's a lonely night, I can see you in the rain, ... train, we'll stroll down dream street, and start kickin' the upbeat". Starlight House, Starlight Drive-in, Misfits' House, Rockin' Roadster, Starlight Express, and the Misfits van are featured. The Misfits sneak into Starlight House. 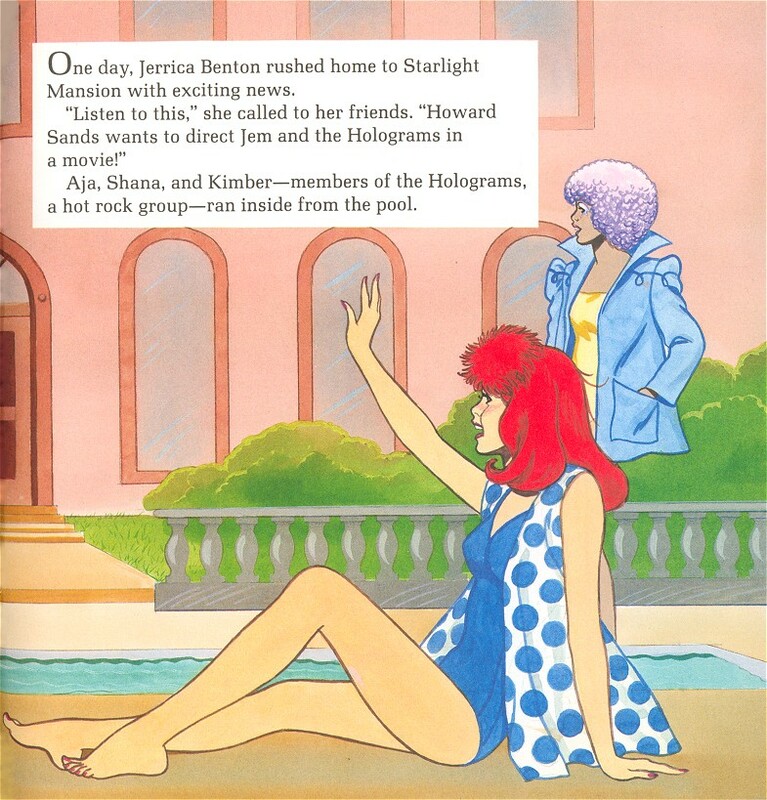 Roxy can touch a hologram of Jem, which is not over Jerrica's body. Stormer finds Synergy at Starlight Drive-in. 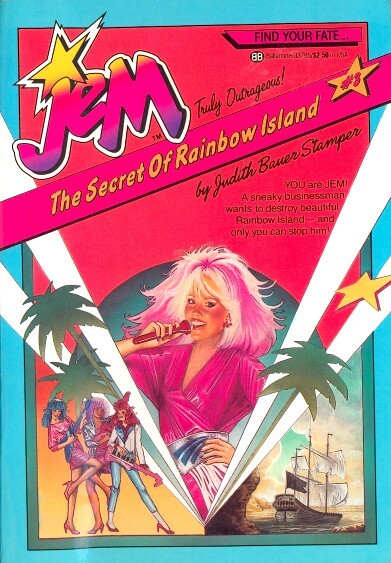 Characters: Jem/Jerrica, Kimber, Aja, Shana, Rio, Synergy, Pizzazz, Roxy, Stormer, Eric Raymond, Terri, Joellen, Ba Nee, Mrs. Bailey, and Danielle. Shares several pages with "A Big Color/Activity Book". The Starlight Drive-in, School, Rockin' Roadster (mentioned as Jerrica's car), and Stormer's guitar-shaped motorcycle is featured. Terri has a friend called "Amy Nelson". Has a story similar to the episode "In Stitches". 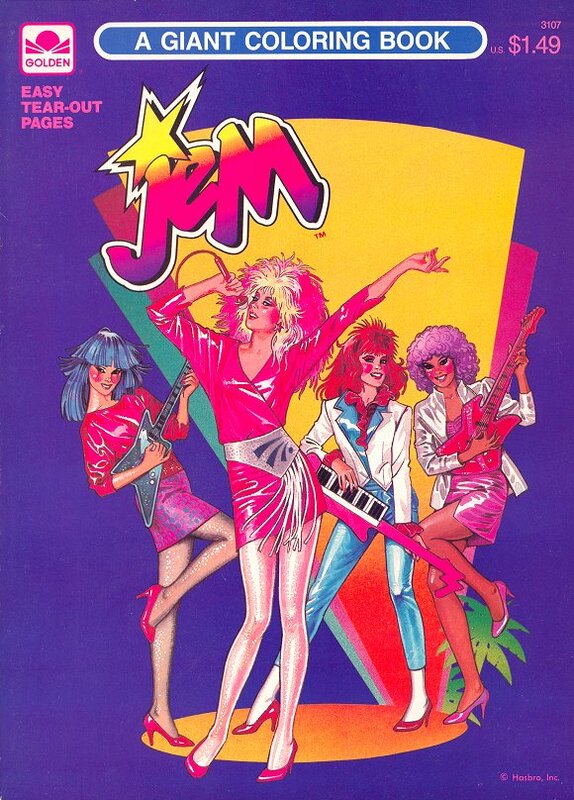 The new line of Jem and the Holograms fashions by Danielle and Shana takes the world by storm. 112 pages with stories to color. 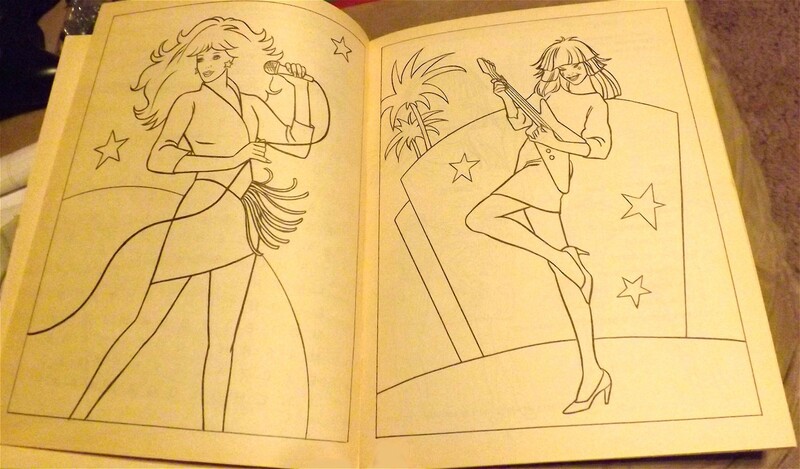 The art seems to have been drawn by someone else than all the rest of the coloring and activity books. Characters: Jem/Jerrica, Kimber, Aja, Shana, Rio, Synergy, Pizzazz, Roxy, Stormer, Eric Raymond, Ba Nee, Delaree, Anne, Terri, and Joellen. Shana plays a guitar instead of drums. 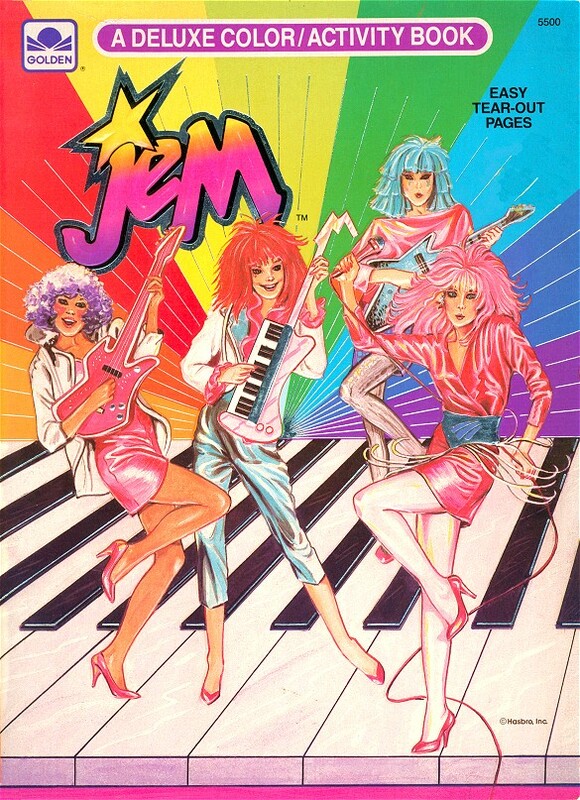 Rio has booked a gig for Jem and the Holograms. The Misfits van, the Rockin' Roadster and Rio's van are featured. Eric is surfing at the beach. When Pizzazz steals Rio away on the dancefloor, Jerrica projects a hologram of an old man's face over Rio's face. Rio calls himself good looking. Roxy reads a magazine called "Bizarre". Jerrica projects seaweed all over Pizzazz when she gets out of a pool. 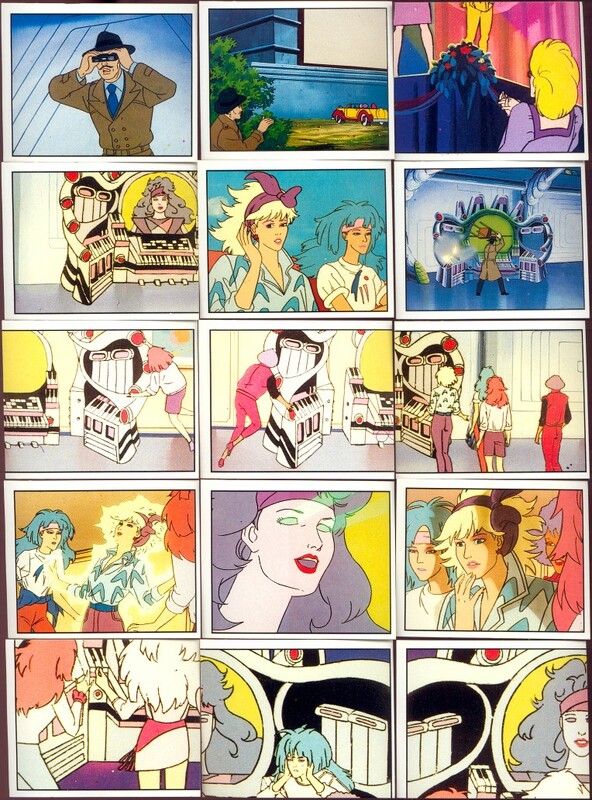 Synergy projects a hologram of Jem over Pizzazz's body. Synergy has some kind of effect that is able to blow air, and not out of the computer but out of her hologram shape. Pre-cut paperdolls and 19 fashions: Jerrica's original outfit, Rock Country Jerrica, Jem's original outfit, Only The Beginning Jem, Music In The Air (Jerrica's half) for Jerrica, City Lights (Jem's half) for Aja, Music Is Magic for Shana, Twiligt In Paris for shana, Award Night for Jem, Command Performance for Kimber, Encore for Aja, Shana's original outfit, Kimber's original outfit, Aja's original outfit, Dancin' The Night Away for Kimber, Rio's doll outfit, Truly Outrageous for Rio, On The Road With Jem (with white pants though) for Rio, Hawaiian shirt for Rio. And three sets of earrings for yourself, including the Jemstar earrings. Back. Also released in France. 22 easy tear-out pages. 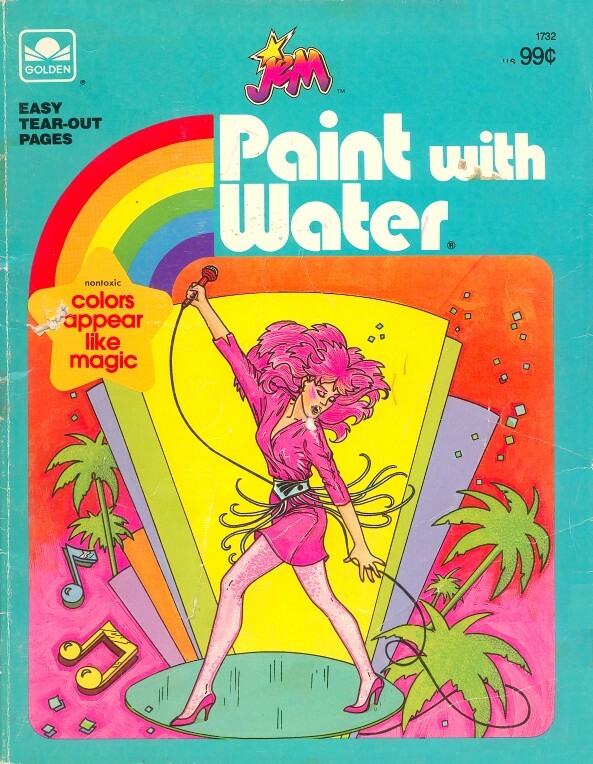 Seems like you're just supposed to wet the pages with a paintbrush to make the "nontoxic colors appear like magic". 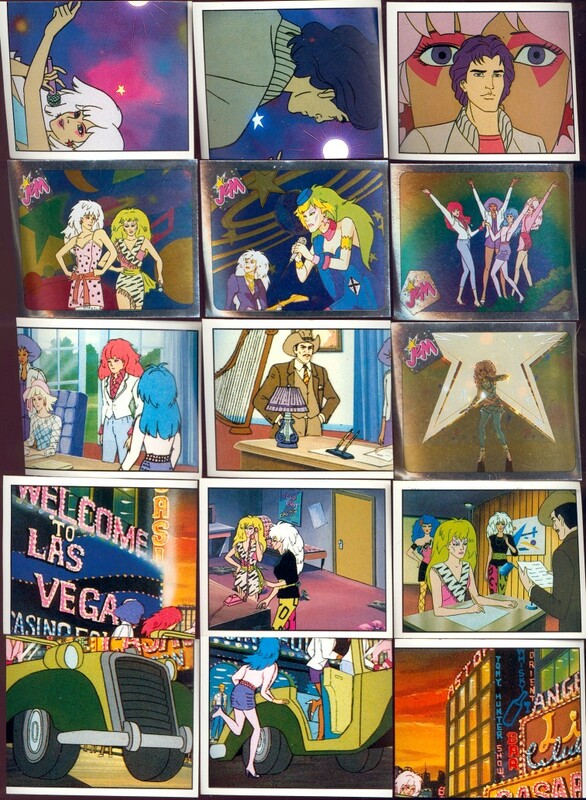 Characters: Jem/Jerrica, Kimber, Aja, Shana, Rio, Synergy, Pizzazz, Roxy, Stormer, and Danielle. Pizzazz and Roxy wear big hoop earrings. 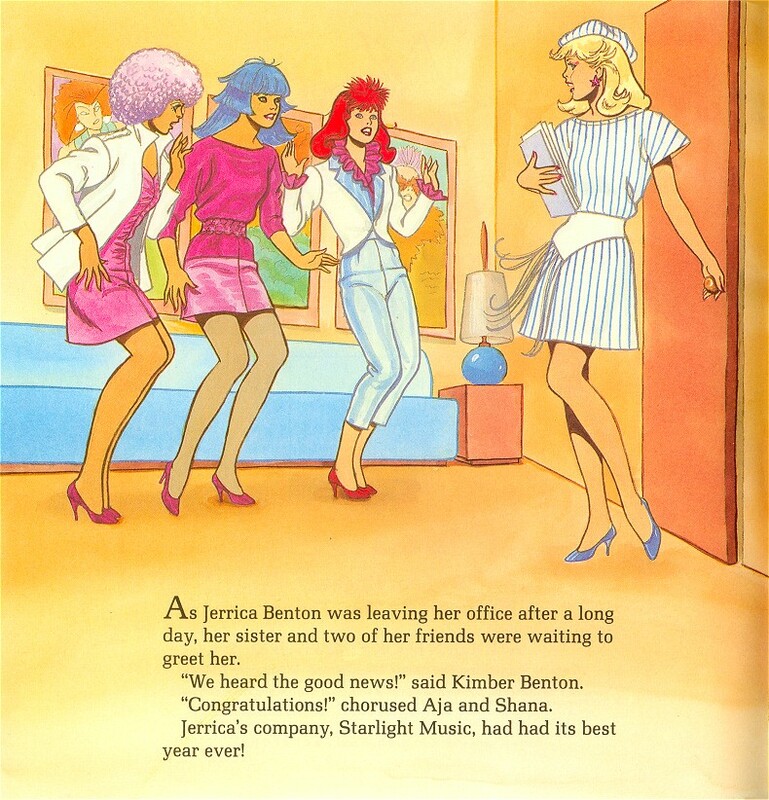 Very good at portraying the characters after their personalities: Rio dreams about both Jerrica and Jem, Kimber writes the songs, Aja likes exercise, Shana designs the fashions with Danielle. Pages: 1, 2, 3, 4, 5. 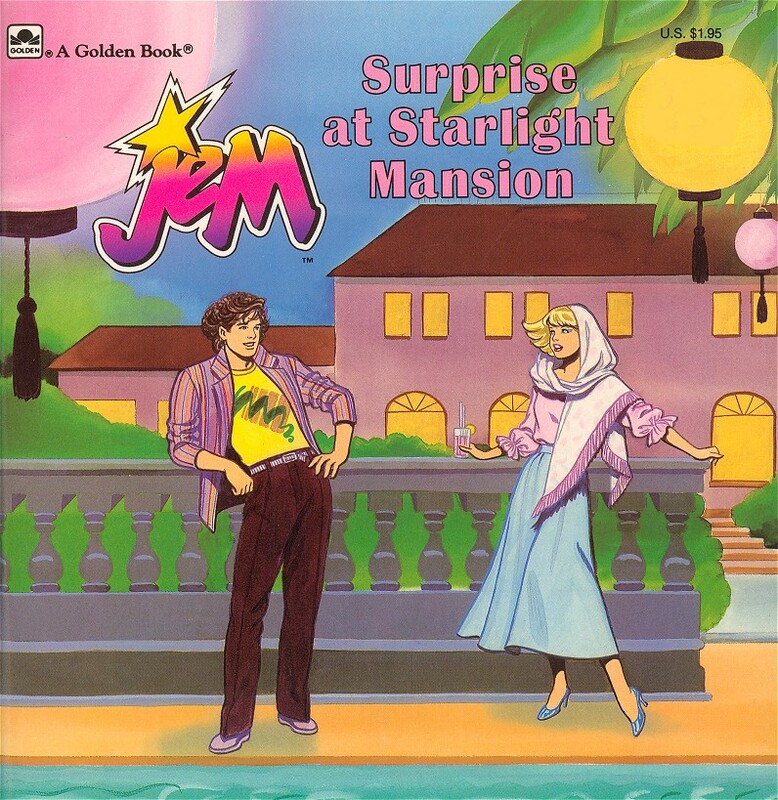 The story takes place while the Jem and the Holograms still live in Starlight House, Eric still owns half of Starlight Music and has the Misfits signed. 48 pages to be colored and include mazes, dot to dot, spot the difference, word games, puzzles and other games. 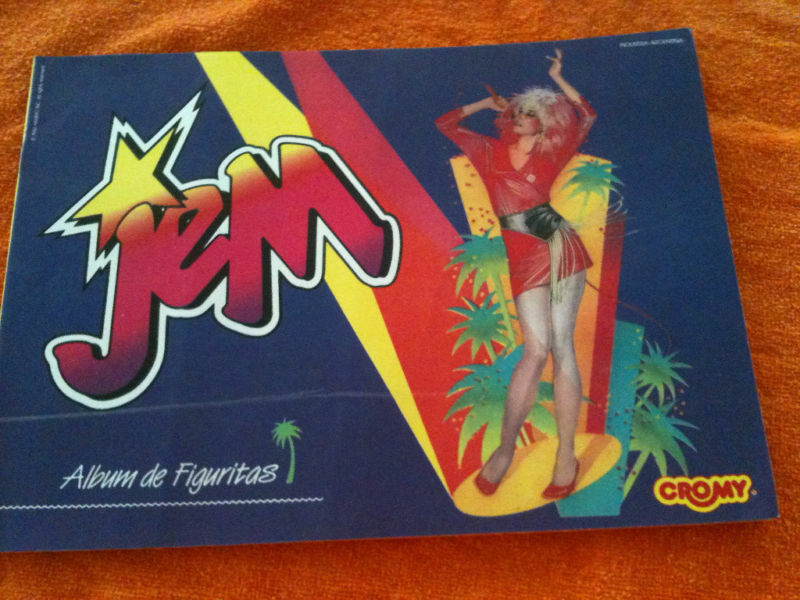 Characters: Jem/Jerrica, Kimber, Aja, Shana, Rio, Synergy, Pizzazz, Roxy, Stormer, Eric Raymond. Funny notes: Rockin' Roadster and Starlight Music are featured. 48 pages to be colored and include mazes, dot to dot, spot the difference, word games and other games. In stead of the World logo, this book says Cliveden Press, and inside "Exclusive to Marylebone books". Funny notes: Contains the real full name of Aja Leith, correctly spelt, and even the full name of Emmett Benton. The Misfits are called dreaful and said to look like demons. It says Kimber loves to play different instruments from time to time. Mini Activity Storybook: Double Trouble, 1986 by World International Publishing Ltd.
48 pages with a story, pages to be colored and games. 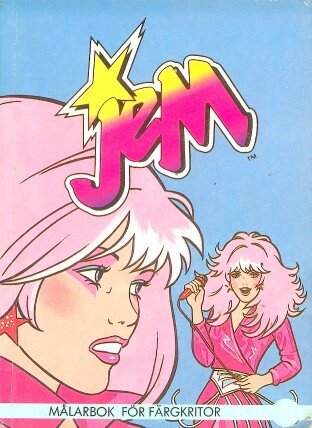 Story: Pizzazz is tired of the fact that the press only wants to talk to Jem, and at a hamburgerbar Pizzazz finds a girl who reminds her of Jem, and has her disguise herself as Jem so that the press will have to speak to Pizzazz to get to speak to Jem, and the Misfits will get free publicity. Characters: Jem/Jerrica, Kimber, Aja, Shana, Rio, Pizzazz, Roxy, Stormer, Eric, Sharon Small. Funny notes: It's mentioned that Jerrica has an office in the Starlight House. 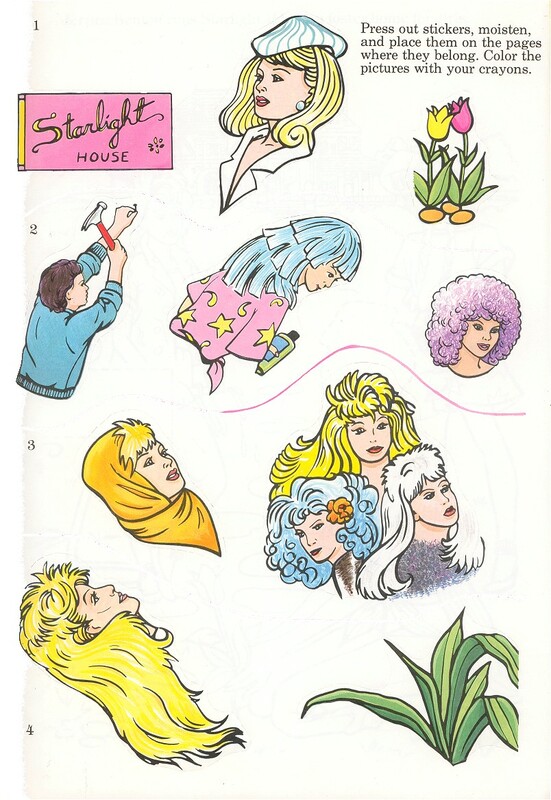 Mini Activity Storybook: Making Mischief, 1986 by World International Publishing Ltd.
57 pages, 31 of the story, 7 to be colored and 9 of games. Story: Pizzazz tries to break up Jerrica and Rio by having it look like Pizzazz and Rio is a couple on TV and in newspapers. 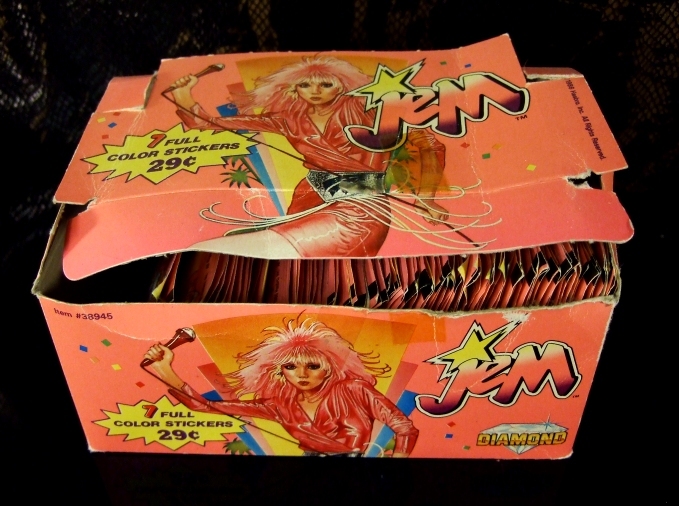 Characters: Jem/Jerrica, Kimber, Aja, Shana, Rio, Pizzazz, Roxy, Stormer, Joey Bronx. Stormer says that she likes Rio and calls him cute, when talking to the other Misfits. While never brought up in the cartoon, it's mentioned that Rio lives in an apartment and has a porter (so not in the Starlight Mansion). 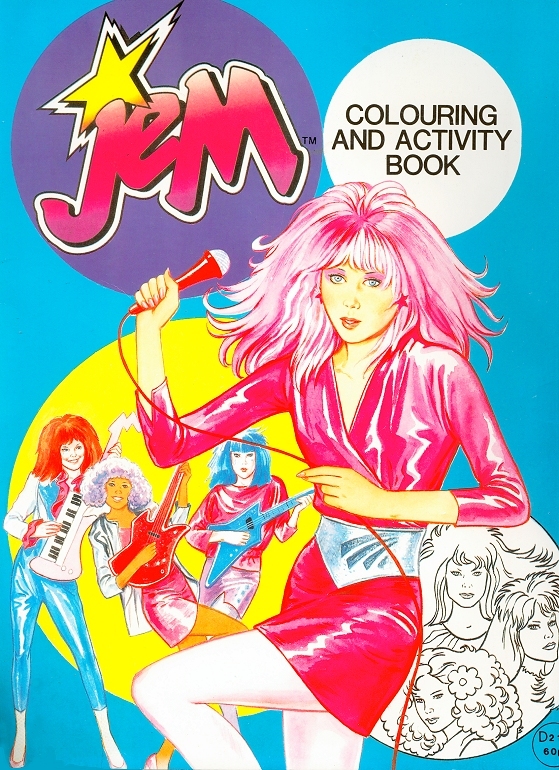 Mini Colouring Book, 1986 by World International Publishing Ltd.
48 colorable pages featuring Jem and the Holograms, the Misfits, Rio and Eric. 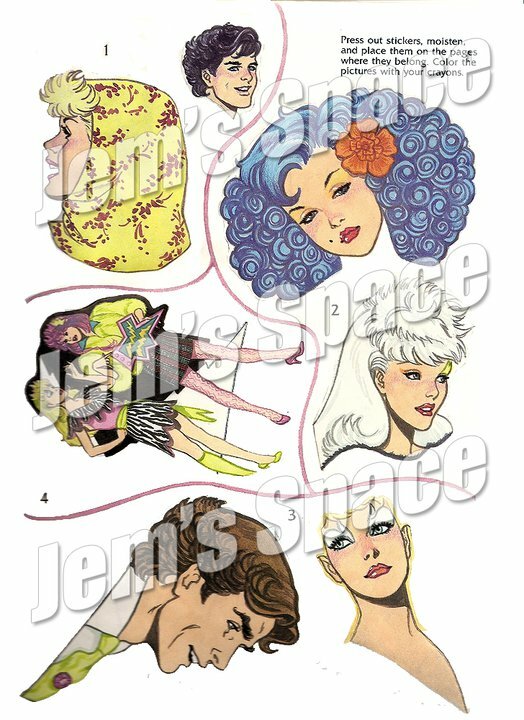 Characters: Jem/Jerrica, Kimber, Aja, Shana, Rio, Pizzazz, Roxy, Stormer, Eric. Printed in Finland. The same as the ones released in the UK, but translated to Swedish and released by a Swedish company. Same book as the UK book Mini Activity Storybook: Double Trouble. The title translates to "Count on trouble". 48 pages with a story, pages to be colored and games. Starlight House gets Swedish names "Starlight-huset" and "Starlight-hemmet" (which translates to the "Starlight home"). It's mentioned that Jerrica has an office in the Starlight House. 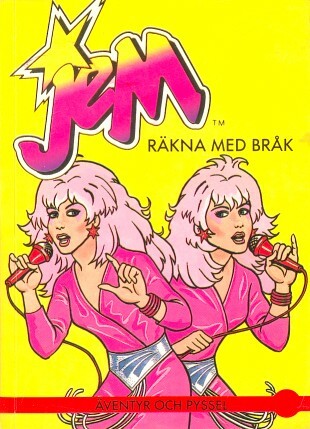 A Swedish version of the phrase "Truly Outrageous" is used, "Jem är helt fantastisk" ("Jem is completely fantastic"), different from the one in the cartoon. The title translates to "Rivals", same as the UK Mini Activity Storybook: Making Mischief. Contrary to the Swedish dubbing of the cartoon, Jerrica actually says a Swedish version of "Showtime Synergy", "Showdags Synergy" and instead of "Show's Over Synergy" she says "Showen är över Synergy". Rio's last name is spelt "Pachecho". The title translates to "colorbook for crayons". Same as the UK Mini Colouring book. One of the US coloring books with a blue background was also available in Sweden, perhaps with Swedish text by Richters like the activity books, probably "A Giant Coloring Book", or "A Deluxe Color/Acivity Book". 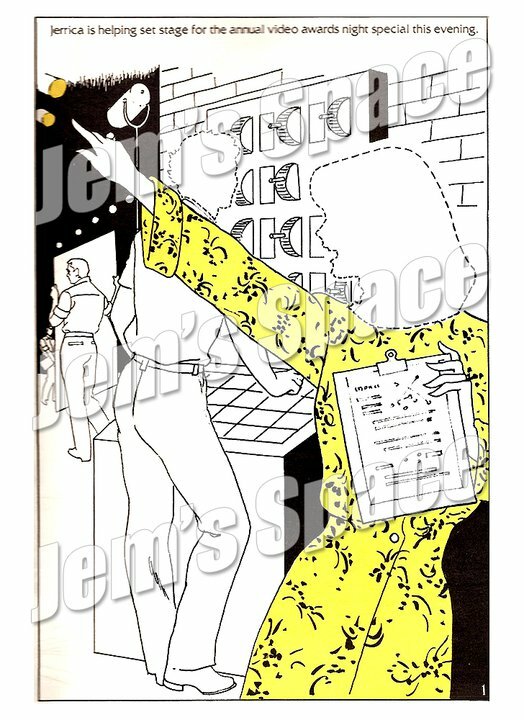 Jem with a dress, Italian drawing. 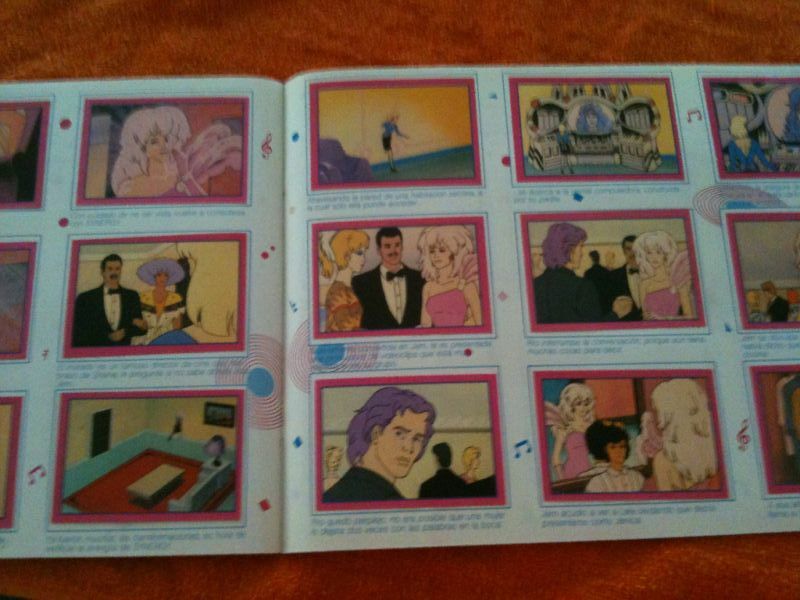 Cartoon TV-stars, including three pages of Jem. 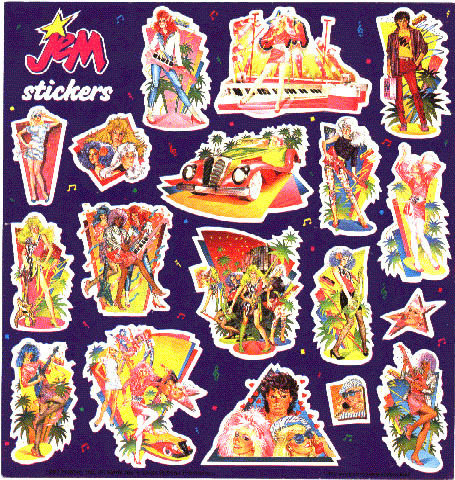 The stickers were square sheets, that were made by a dutch company so they were probably only sold in Holland. The pictures are those airbrushed ones from the first edition doll boxes. 1987 Hasbro , Inc. All rights res. Francis Schenk promotions 1987 introduct ®/ ijsselstein (utr.) holland. The little stickersheet is nummered 832, the labelsheet 831. Made by an Italian company, and available also in Canada, Switzerland and Belgium (if anyone can confirm these countries, let me know). 32 pages to place 243 numbered stickers, plus 12 lettered golden chrome stickers with re-drawn art from the doll line boxes that are to be attached to the poster included. Stickers with silver background feature scenes from music videos: 40, 41, 42, 43, 44, 94, 95, 96, 97, 146, 147, 148, 149, 198, 199, 200, 201 and 202 (except for number 44 which shows a scene with Pizzazz and Nick kissing, and number 40 which is from a commercial bumper). Some stickers are to be attached as two or four: 3-4-5-6, 24-25, 33-34-35-36, 49-50, 53-54, 66-67, 69-70, 85-86-87-88, 92-93, 98-99, 102-103-104-105, 118-119-120-121, 126-127, 128-129, 133-134-135-136, 138-139-140-141, 153-154, 162-163, 175-176, 182-183, 185-186-187-188, 189-190, 206-207, 208-209, 221-222-223-224, 225-226-227-228, 231-232 and 236-237. 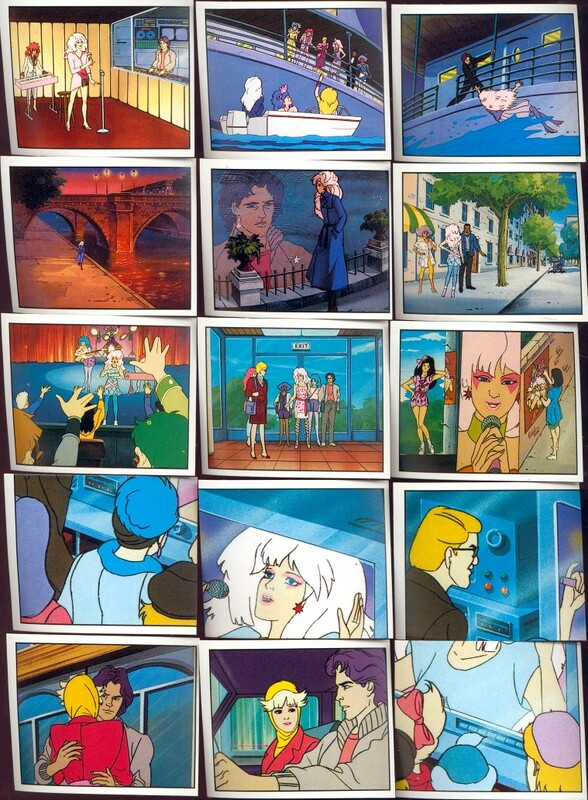 The stickers feature the first 8 episodes (last retakes versions, which weren't even aired in France and Italy). 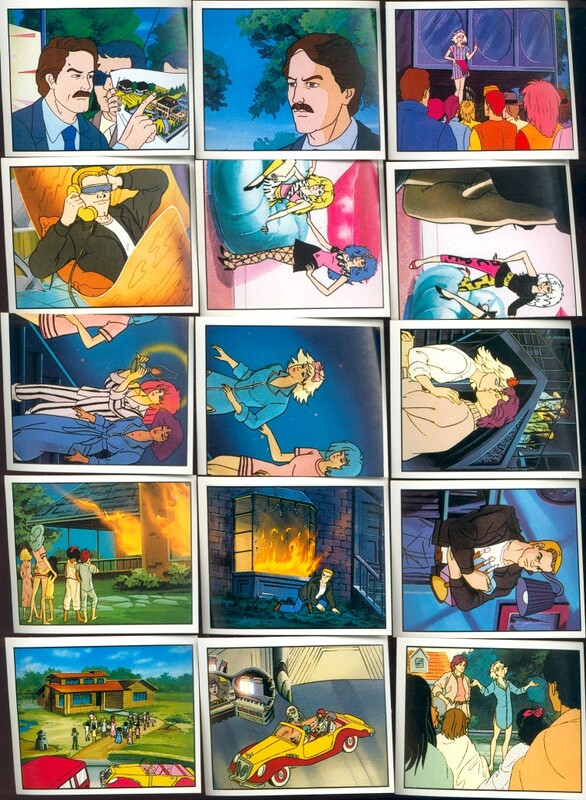 The album contains art from the doll line boxes and re-drawn art from the cartoon, and even from later episodes like "The World Hunger Shindig" and "Island Of Deception". Page 26 (italy) [Picture by Luciano Canova and Marco Valli]. Page 27 (italy) [Picture by Luciano Canova and Marco Valli]. Stickers: 1-15, 16-30, 31-45, 46-60, 61-75, 76-90, 91-105, 106-120, 121-135, 136-150, 151-165, 166-180, 181-195, 196-210, 211-225, 226-240, 241-243 and golden chrome stickers. A juice available in apple, orange or grapefruit flavours. Which multipack, composed by 3 little bricks, contained one pack of Panini stickers. The back of the Panini Album shows this promotion. Further, in the stickers album there was a special coupon you could send to "Billy" to get missing stickers for free, to complete your collection. You had to attach some of the points you find on Billy's bricks. 16 pages with stories, to fill in with 4 pages of stickers that you have to lick on. 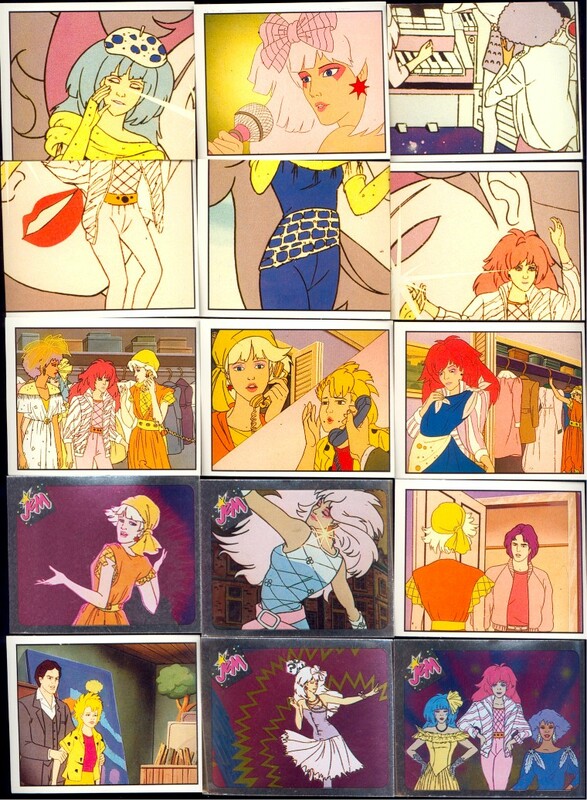 Characters: Jem/Jerrica, Kimber, Aja, Shana, Rio, Synergy, Pizzazz, Roxy, Stormer, Eric Raymond, Ashley, and Terri. Funny notes: Starlight House and the Rockin' Roadster is featured. Synergy first appears in a mirror. The Rockin' Roadster is mentioned to be a gift from Synergy. Characters: Jem/Jerrica, Kimber, Aja, Shana, Rio, Synergy, Pizzazz, Roxy, Stormer, Clash, Eric Raymond, Video. 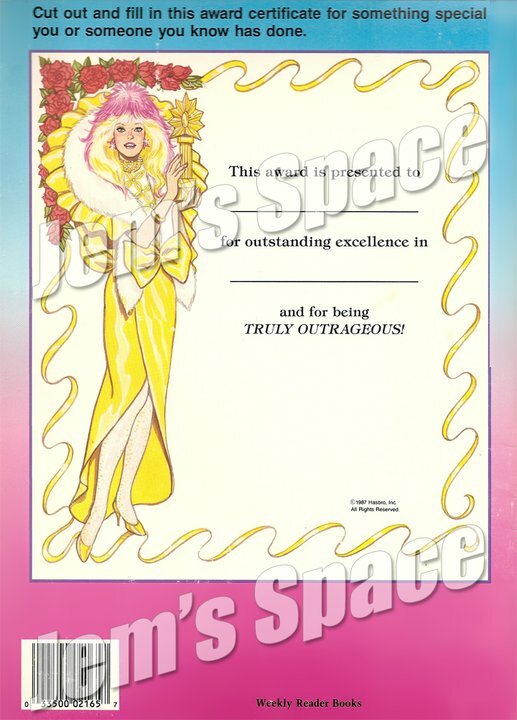 Funny notes: Pizzazz gets to hostess an award presentaion, and she gets to present the award for Jem and the Holograms. Clash actually uses her distortion modulator. But Jerrica puts on some special micro-chips to her earrings to deflect Clash's signals. Room for over 160 stickers. 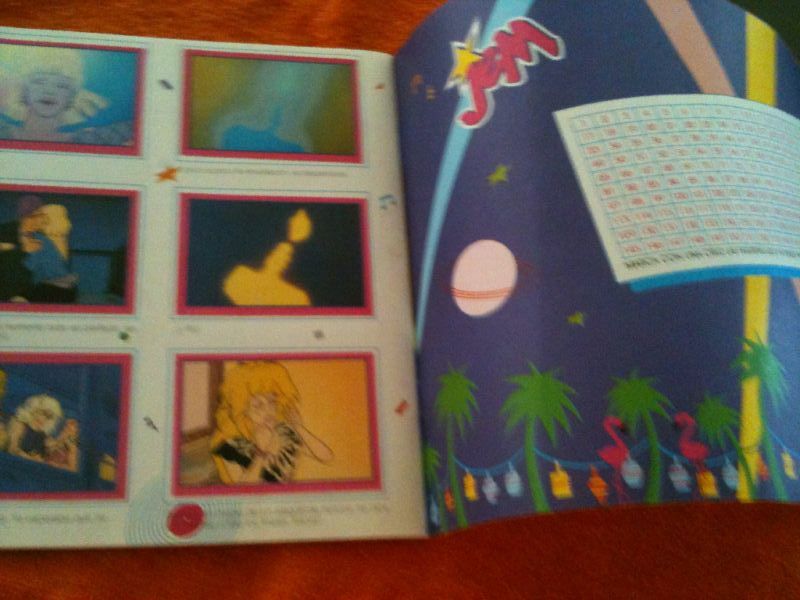 The stickers feature the Starbright three parter episodes (last retakes versions). 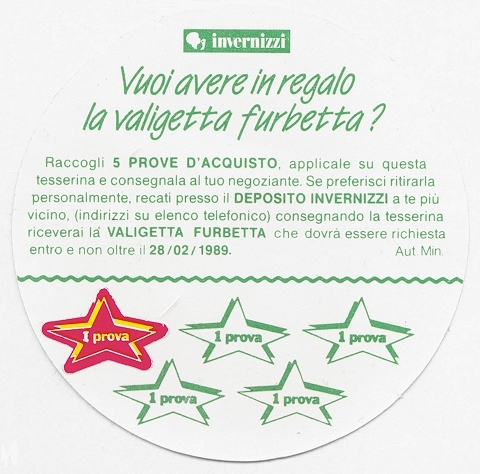 You were supposed to collect 5 of these in Italy and take the little star sticker (which is missing in this picture, but says "1 prova") and put on the backside to receive a free briefcase (Jem briefcase I assume). Assuming you got these when purchasing something, like the dolls. The ending date for this offer was 28/02/1989. Back.